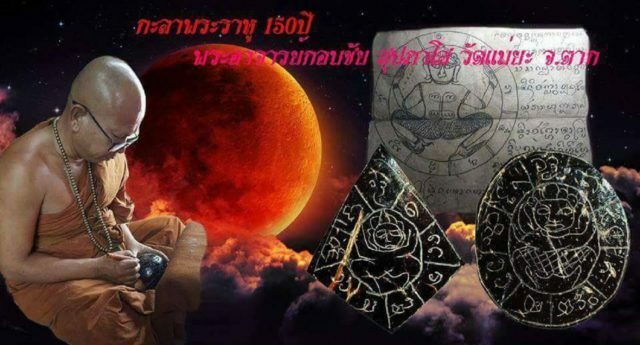 Presenting some Extreme Limited Edition Hand Inscribed and Individually Empowered Meed Haek Wicha Lanna Spirit Knives and Pra Rahu Kala Ta Diaw One Eyed Coconut shell carved Eclipse God amulets, from Pra Ajarn Gorp Chai Wat Mae Ya. 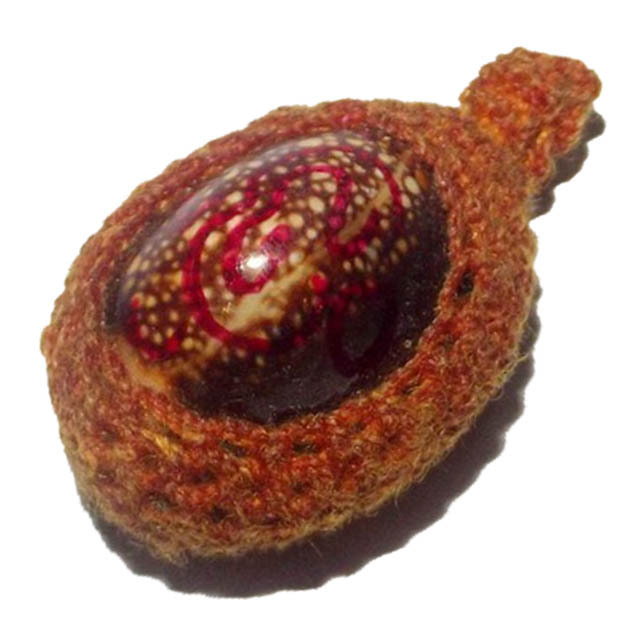 These extreme limited edition Traditionally Amulets are inimitable in the present Era and can only be most highly recommended for their authentic creation and empowerment methods, and traditional preservation of the Ancient Northern Wicha Saiyasart Lanna. 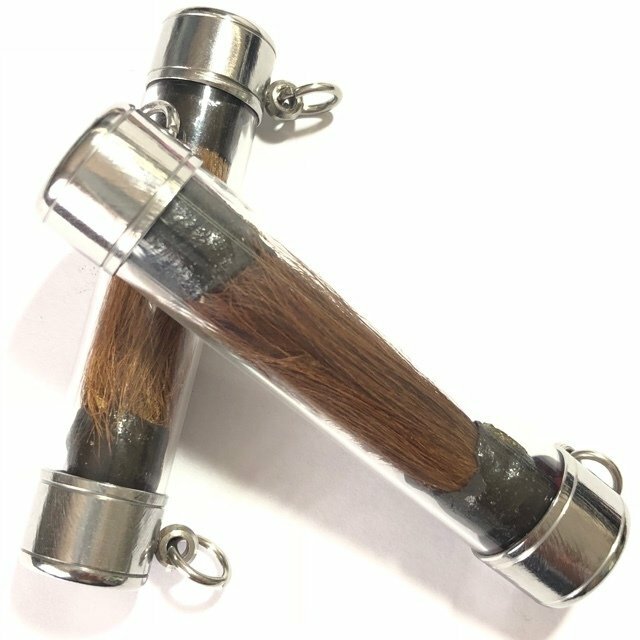 The amulet features a small ‘Ito’ style hatchet shape blade with hand inscriptions of Agkhara Spells, which is inserted into a hand carved hilt made from albino buffalo horn Please Note, due to the hand made nature of these amulets, each amulet has slight differences. 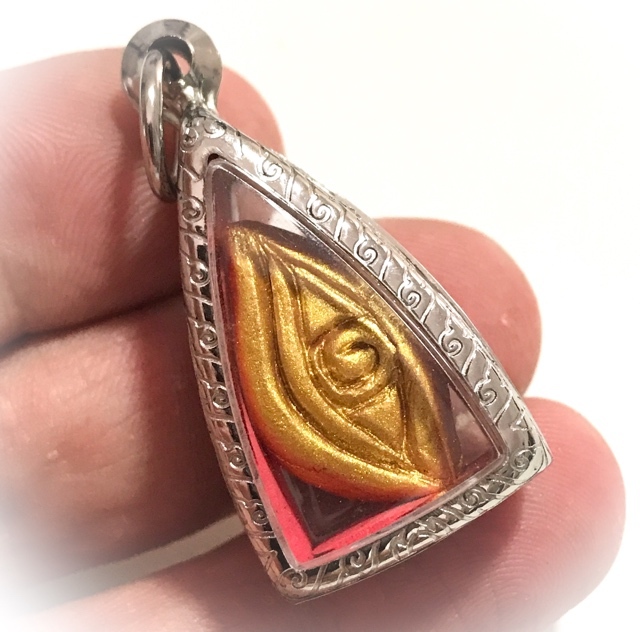 The amulet received, may differ slightly from the one in the image, but will be of equal power, quality and authenticity. 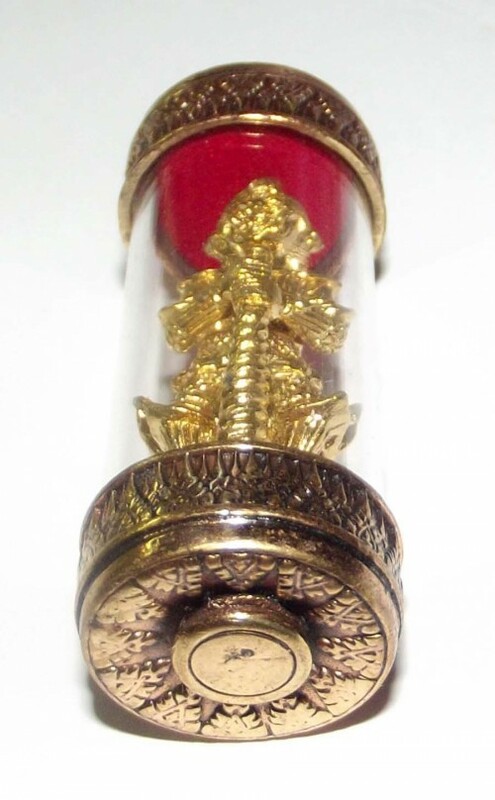 This edition included these special old school Lanna Meed Haek, and an extreme limited edition of 105 hand carved and inscribed Pra Rahu Asura Deva amulets made from the incredibly rare one eyed coconut shell, which were blessed along with the Meed Haek on the 150th anniversary night of Wat Mae Ya, which coincided with a Lunar Eclipse, making this a very powerful combination of auspicious alignments for empowerment of this edition. 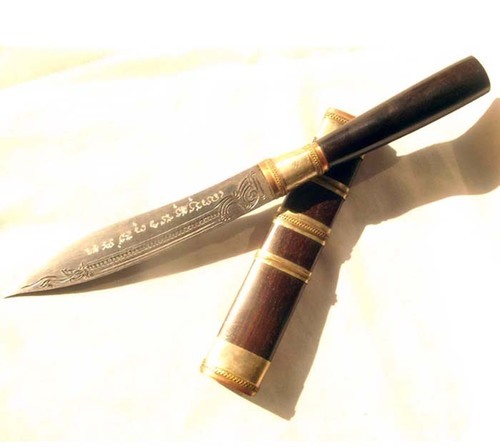 Meed Haek and Mitmor ritual knives are used for Bucha to pray to for Blessings, but are also a kind of Magic Wand, Sceptre of Command over Spirits and Ghosts, and a Weapon to Banish Evil Spirits and Nullify Curses. 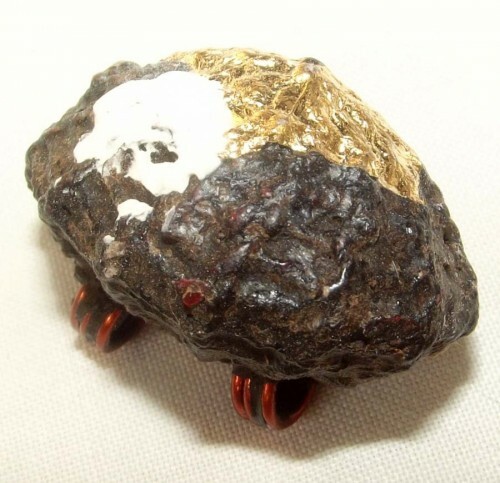 Mitmor are used by the Masters to perform Inscriptions on the devotees, or upon inanimate objects, to invoke magical spells and bestow blessings. Below; Pra Ajarn Gorp Chai inscribing Pra Rahu Kala Ta Diaw amulets and the Meed Haek during a Lunar Eclipse on the 150th anniversary of Wat Mae Ya temple. 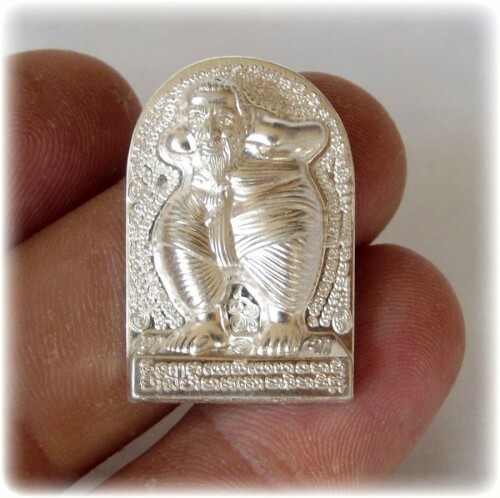 The amulet features Pra Rahu Om Jantr (Rahu eating the Moon) as a central figure. Sacred Yantra with Lanna Agkhara are embossed either side of the Rahu Deity. 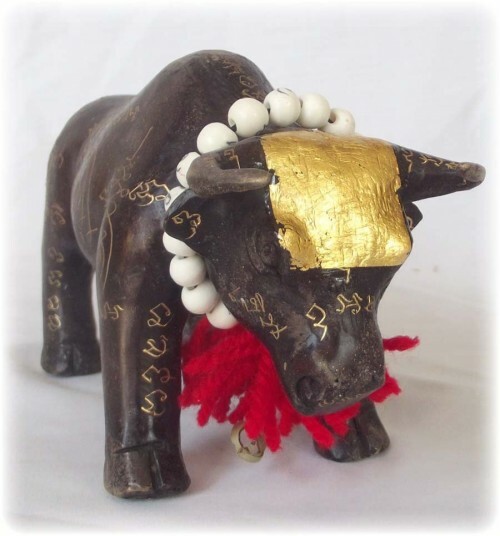 Paying Bucha to Pra Rahu is essential for turning ones Fate around in times of Trouble. 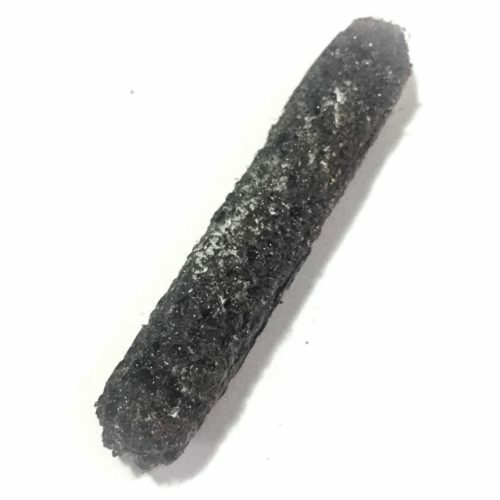 Pra Rahu improves your Horoscope, and removes dark influences and Inauspicious Unlucky events. 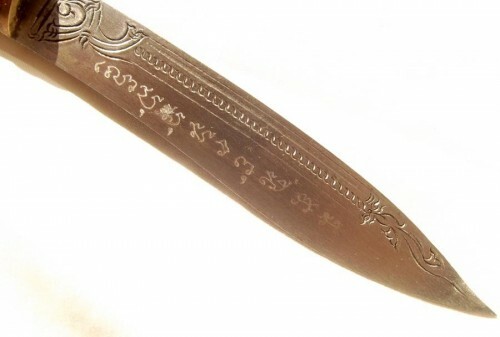 In the Lanna Tradition, the ‘Mitmor’ Ritual Knife is known as ‘Meed Haek’. The word ‘Haek‘ means ‘To Scrape’, or to cause to split open wide. 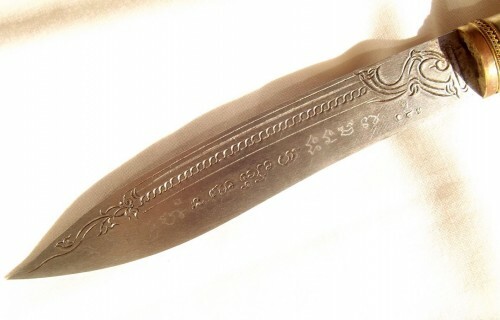 The Meed Haek, is generally considered to be a small portable, blunt rounded symbolic knife, that is found throughout Lanna Cultures. 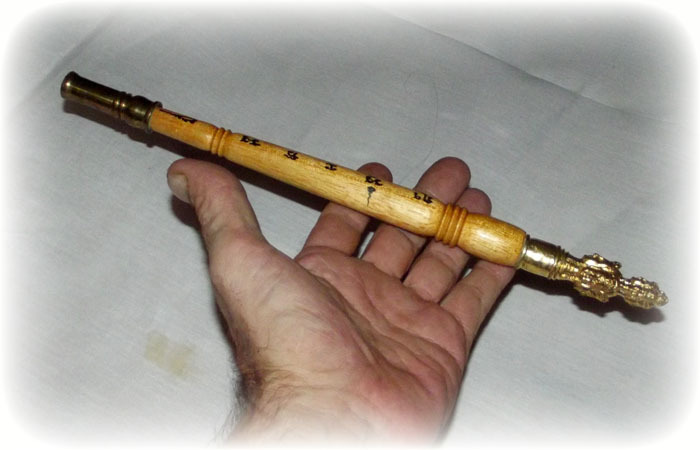 The Meed Haek or Mitmor can be used to stir prayer water whilst performing incantations for whatever kind of blessings one may seek to invoke, be they Kong Grapan Chadtri Klaew Klaad, Maha Lap Maha Pokasap, Jerajaa Khaa Khaay, or Metta Maha Niyom Maha Sanaeh. You can use Buddhist Prayers and Candles to perform Holy Water Making, and stir the water in a clean clear bowl with clean clear water in it. Meed Haek is a very Prominent Protagonist in the Pantheon of ‘Krueang Rang Lanna Sastrawut’ Magical Weaponry Amulets. 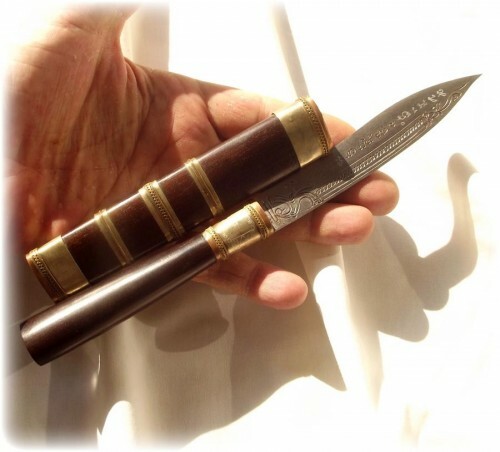 The Meed Haek and its Ritual Empowerment Methods are bound to the same methods of Sorcery used for making other kinds of magical weaponry, such as Ritual & Ceremonial Swords, like the ‘Dab Sri Ganchai’. 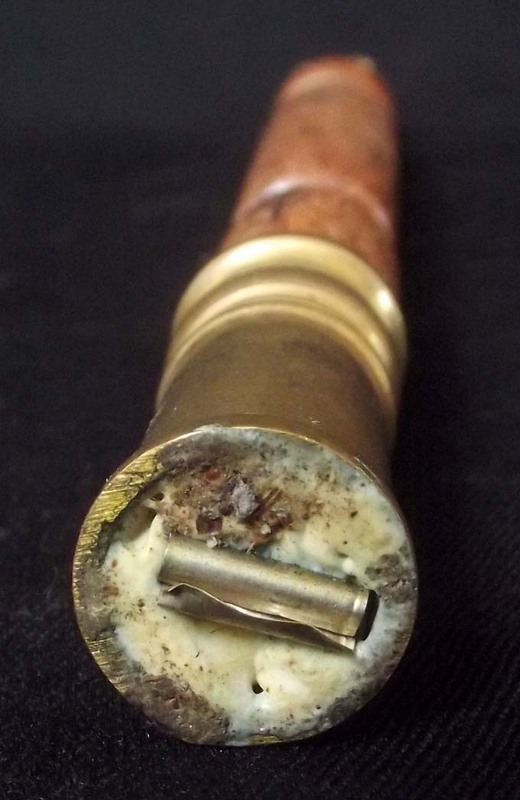 The Ritual methods used in their making are both highly complex, as well as varied, depending on the nature of the magic intended to be imbued within the weaponry, and the materials used to make it. 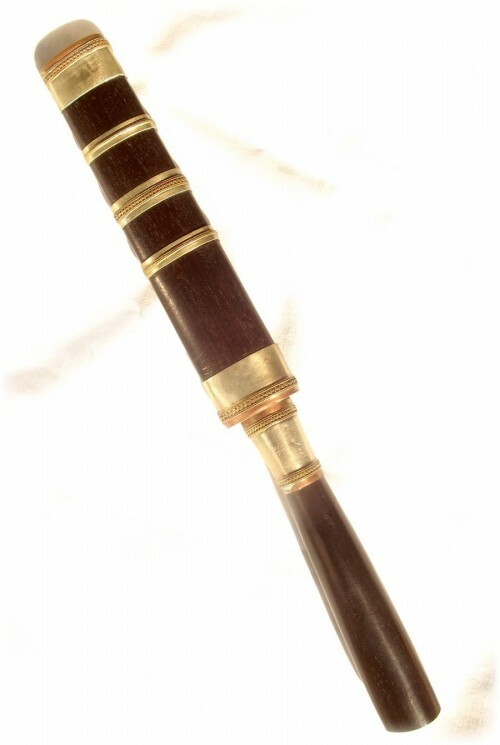 Hilts and Sheaths can be made from Sacred or Precious Metals, Wood, or other natural Substances such as Horn, Ivory, Onyx or Lek Lai Kaya Siddhi elemental substance. 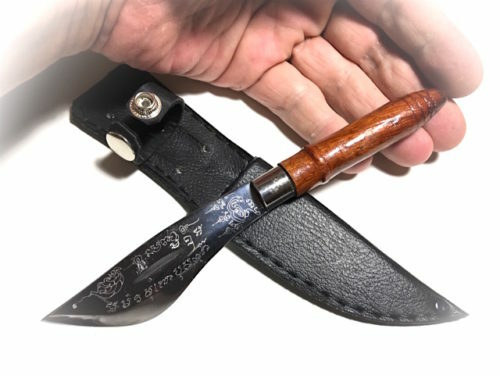 Blades are usually forged from metal using Alchemical Forging methods, but can also be seen to be made from other materials, such as the split Tusk of an Elephant, or a piece of Sacred wood. 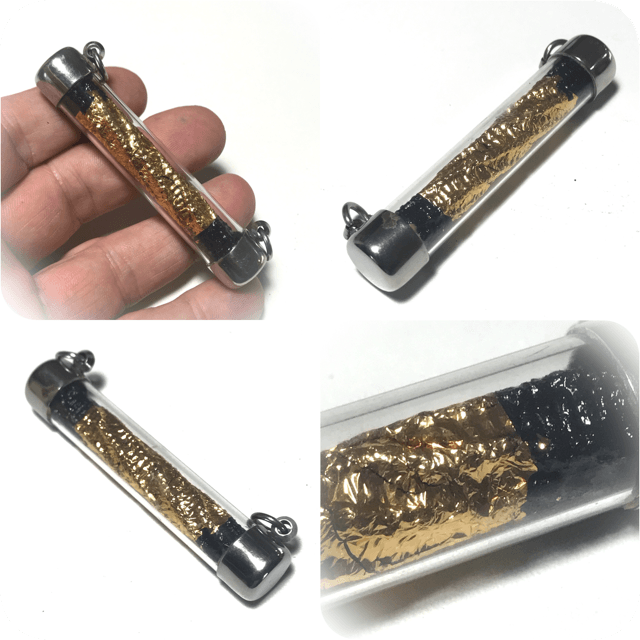 The making of Sacred Metals for forging into blades for Meed Haek, Dab Akom swords and knives, has a rigid set of rules and formulas for which kind of substances can be used. 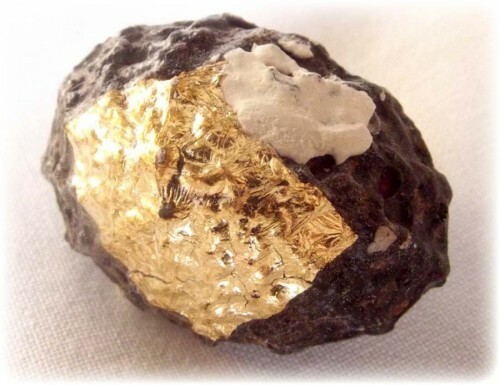 Metals are selected and chosen for their Sacred or Magical values. There are stringent ancient formulas, how they should be mixed and empowered as ‘Chanuan Saksit’. 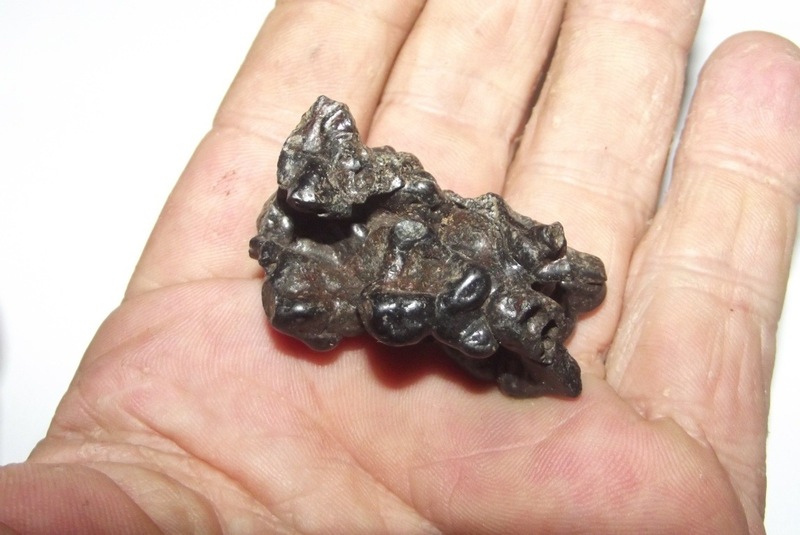 ‘Chanuan Saksit’, is a word used to refer to the Sacred metallic substance, which results from smelted artefacts, metallic elements and minerals. 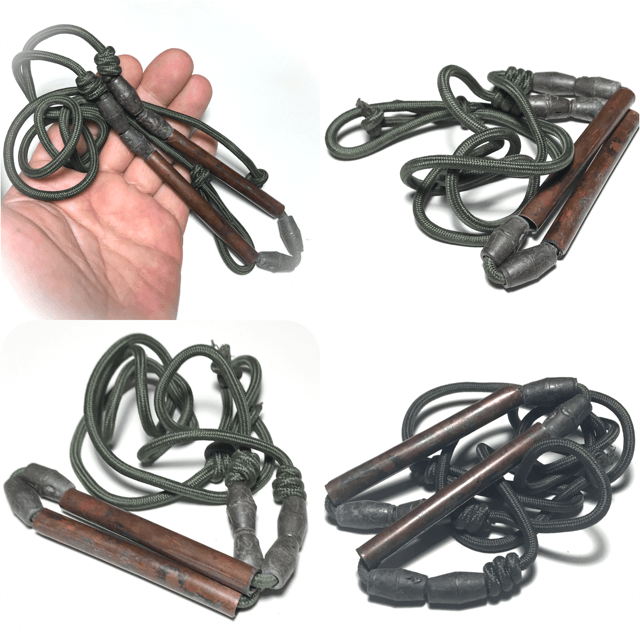 Pra Ajarn Gorp Chai chose to use one of the most powerful Buddhist Magical Metal Artefacts for his sorceror knives, the Tapu Sangkwanorn Ancient Shrineroom Roof Nails. 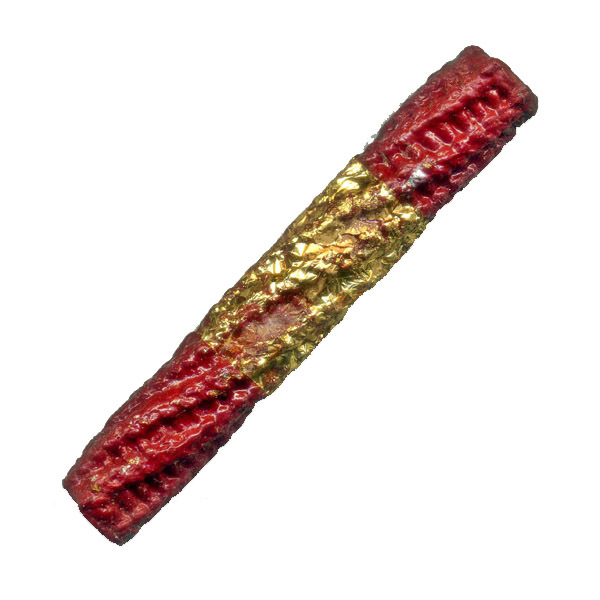 Below; Ancient Sacred Tapu Sangkwanorn Shrineroom Roof Nails from the Early Ayuttaya Era, used in the smelting of the Sacred Chanuan Muan Sarn for the Meed Haek Lanna. Pra Ajarn Gorp Chai is the continuing lineage practitioner of the Wicha of Luang Phu Kroo Ba Ban (Wat Mae Ya), through Kroo Ba Wang (Wat Ban Den), and is a Lanna Monk who has continued the Wicha of Kroo Ba Wang through the Lineage of his Kroo Ba Ajarn in the most diligent fashion, as well as increasing the spells within the repository of grimoires at Wat Mae Ya. He has performed every stage of the alchemical metallurgy processes and ritual methods of creation of these Meed Haek Lanna, through his own immense efforts and insistence on personal attention to every step of the process.He has expanded the magical repository of knowledge of his Lineage with his constant seeking, collecting of ancient Grimoires of Sorcery of the Thai Yai and other Lanna Folk. 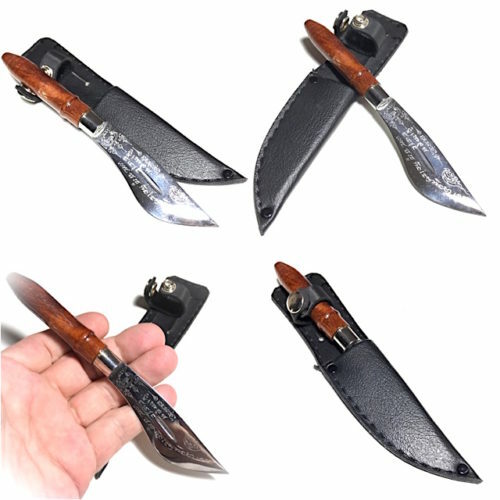 This is a truly rare collection of Meed Haek (Mitmor) Rital Knives in Lanna Tradtiotional Old School style, which Pra Ajarn Gorp Chai performed all stages of the preparation of the sacred chanuan muan sarn metals for the forging of the magical blades, and for the carving of the Khao Kwai albino buffalo horn hilts. A very complex series of ritual preparations were necessary to create his Meed Haek and his Pra Rahu Kala Ta Diaw Amulets, of which only extreme limited numbers were made (105). 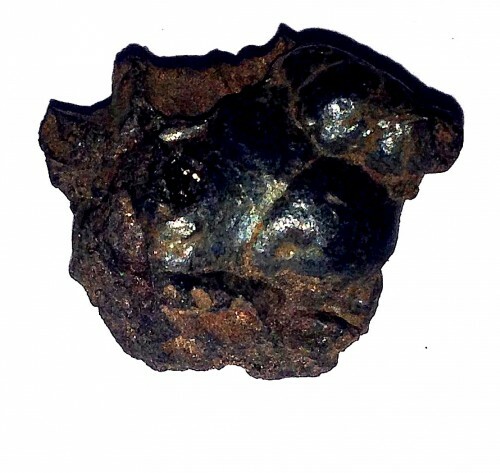 The Meed Haek were alchemically forged using Tapu Sangkwanorn Uposatha Roof Nails from Ancient Temples of the Ayuttaya and Pre Ayuttaya Era. 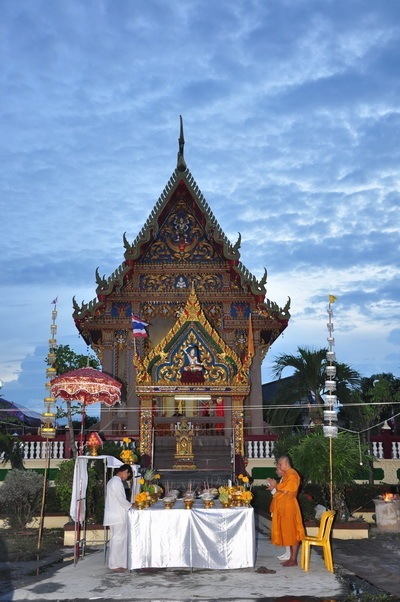 Tapu Sangkwanorn are magical artefacts which are considered to be extremely powerful and magical substances, being leaden, they absorb the prayers and chants and meditative powers of the monks of centuries of morning and evening prayers and other ceremonies. 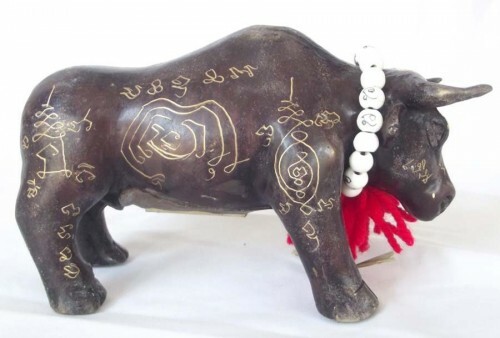 Pra Ajarn Gorp Chai is extremely proficient in the Wicha of Lanna Amulet making and in addition, a Master of Kata Akom and Agkhara Lanna Magical Script, and Sak Yant Thai Temple Tattoos. Pra Ajarn Gorp Chai refuses to allow himself to be tempted to invent any modernisations, and maintains the integrity of the Northern methods of Lanna Sorcery. Below you can see him empowering some of his recently hand made amulets which he made specifically on request for Ajarn Spencer Littlewood (Proprietor of Thailand Amulets), for distribution to you our friends and customers. He has expanded the magical repository of knowledge of his Lineage with his constant seeking, collecting of ancient Grimoires of Sorcery of the Thai Yai and other Lanna Folk. 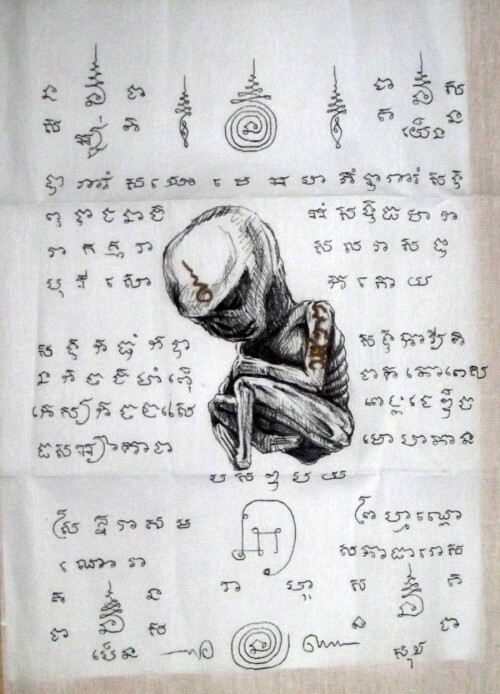 He is extremely proficient in the Wicha of Lanna Amulet making and in addition, a Master of Kata Akom and Agkhara Lanna Magical Script, and Sak Yant Thai Temple Tattoos. 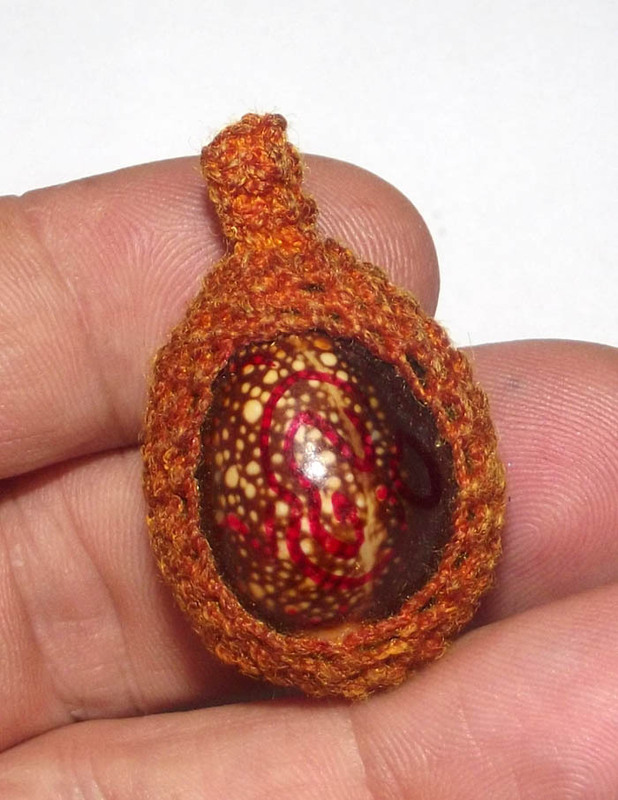 Nor did the Ancient Masters have to accept to bless amulets which were mass made, and donated for blessing, rather, used their own precious time and efforts and Meditations to create and empower each amulet one after the other, passing through the hands and incantations of the Master one by one. These days, it is truly difficult to find a Master who still uses this old-school method of personal applied Wicha and without assistance from third parties. 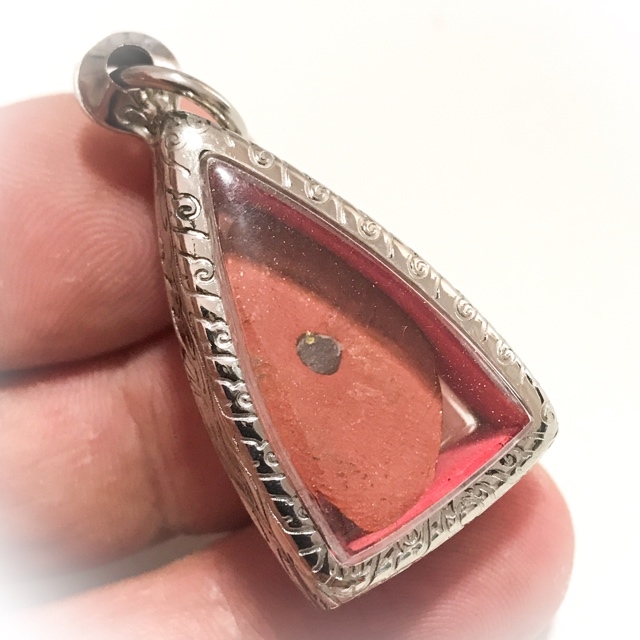 Nor did the Ancient Masters have to accept to bless amulets which were mass made, and donated for blessing, rather, used their own precious time and efforts and Meditations to create and empower each amulet one after the other, passing through the hands and incantations of the Master one by one. 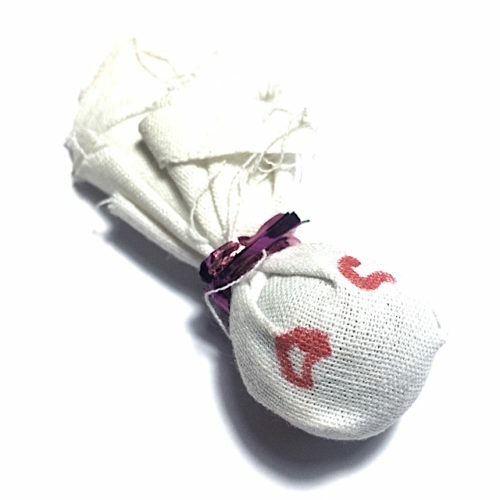 We feel that the amulets of Pra Ajarn Gorp Chai, are amongst the most highly recommendable, and authentically empowered, with the inimitable personal touch of the master. This is becoming ever harder to find in modern times. 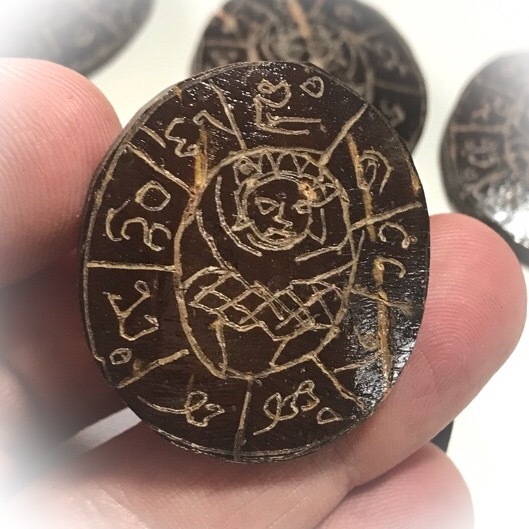 it is our duty to discover and present you with the best amulets with authentic Wicha, and this is the reason why Pra Ajarn Gorp Chai has become one of our top recommended present day masters. 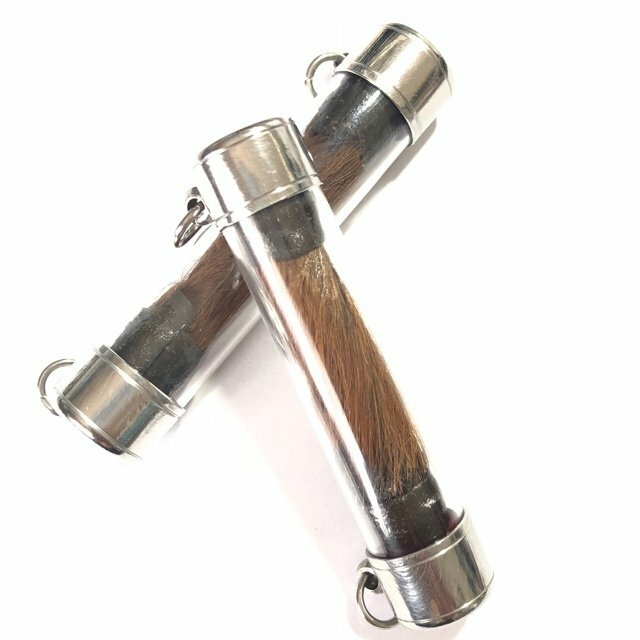 Hand made limited edition authentically made and empowered Lanna Talismanic Charms like these, should be impossible to find in the present day, where most Masters have hordes of devotees to assist in the making of the amulets. Pra Ajarn Gorp Chai remains faithful to the olden days methods. 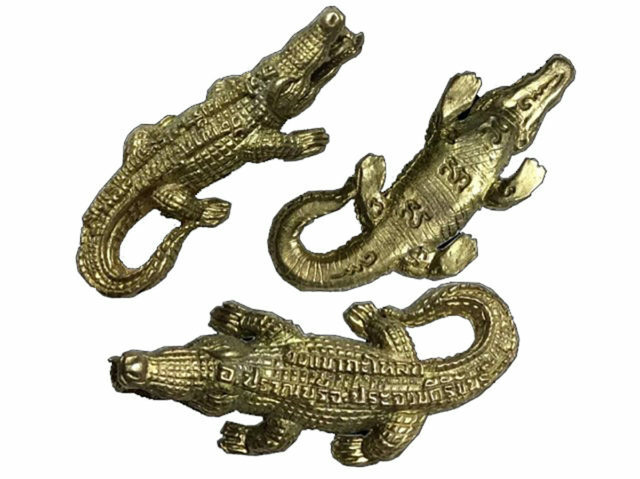 We are blessed to be able to still find and obtain traditionally made olden days style amulets which have been given such diligent personal attention from the master in this present Era, through the Merits of Pra Ajarn Gorp Chai. 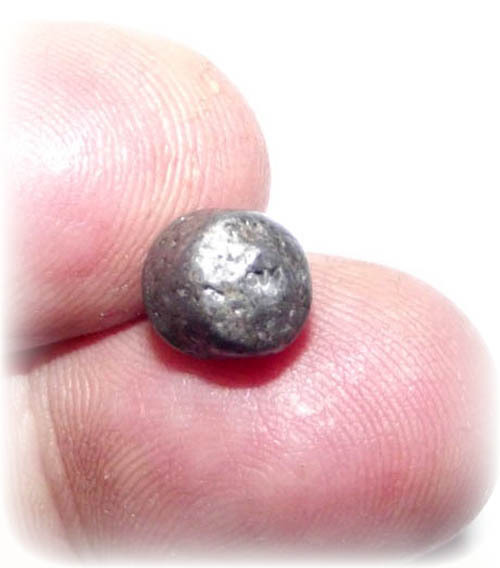 We can but recommend the amulets of Pra Ajarn Gorp Chai most highly for this reason. Pra Ajarn Gorp Chai is a lineage master of Wat Mae Ya, following in the tradition of his Kroo Ba Ajarn, Luang Phu Thin (Current Abbot) and the Great Luang Phu Kroo Ba Ban. Wat Mae Ya is the temple of the Late and Great Arya Sangha (said by his devotees to have attained Arahantship), Luang Phu Kroo Ba Bpan, who transmitted the Wicha of Kroo Ba Wang to Pra Ajarn Gorp Chai. Pra Ajarn Gorp Chai is continuing the Wicha and Traditional Amulet making of the Great Kroo Ba Ajarn; Luang Phu Kroo Ba Ban, the ex Abbot of Wat Mae Ya temple. 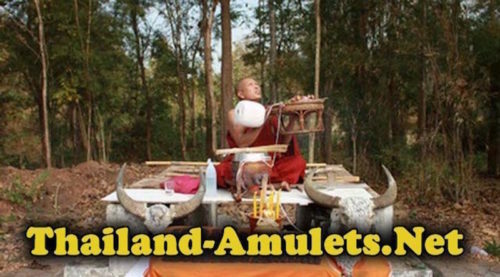 The topic of Meed Haek Lanna and Dab Akom Magical Ritual Swords and Blades is given a very detailed chapter in Ajarn Spencer’s 6th Buddha Magic Episode in the Ebook ‘The Book of Thai Lanna Sorcery’, from Buddha Magic Multimedia and Publications, also available on this website in the Publications section. 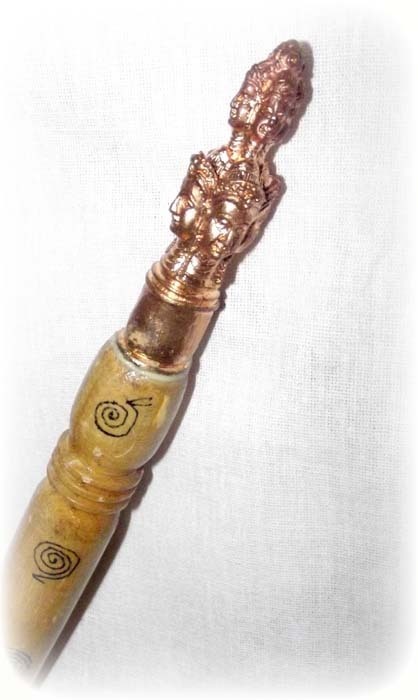 A look at a rare and now classic Mitmor Ritual Spirit Knife, for Protection against Black Magick, Deadly Dangers, and to Improve the Auspicious Alignments, and Clear away Hidden Obstacles deriving from Magical Causes, from Luang Phu Sin, of Wat Laharn Yai. Luang Phu Sin is a Great Master of the Lineage of the Great Deceased Master, Luang Phu Tim (Wat Laharn Rai), along with Luang Phu Tim’s other great apprentice, Luang Por Sakorn (now also deceased). 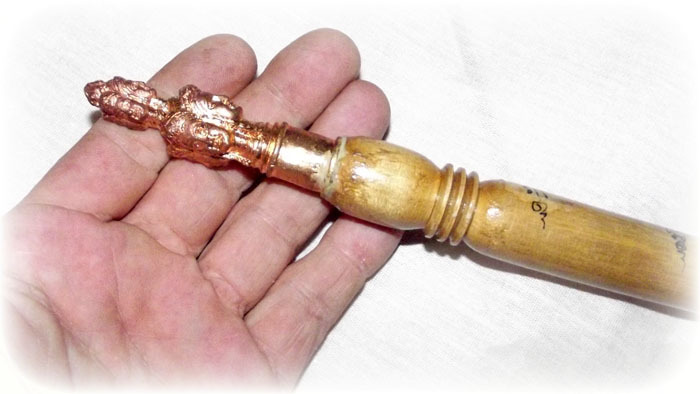 The Mitmor is used for Bucha to pray to for Blessings, but is also a kind of Magic Wand, Sceptre of Command over Spirits and Ghosts, and a Weapon to Banish Evil Spirits and Nullify Curses. 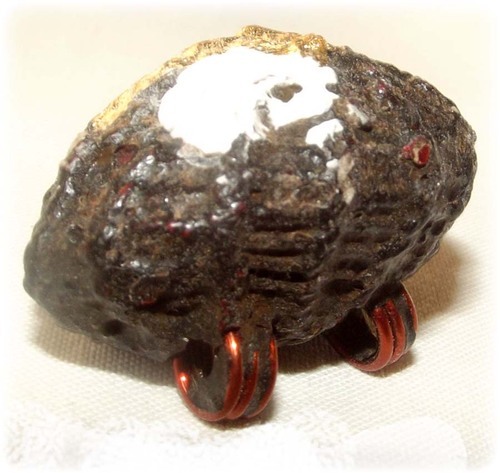 Mitmor are used by the Masters to perform Inscriptions on the devotees, or upon inanimate objects, to invoke magical spells and bestow blessings. 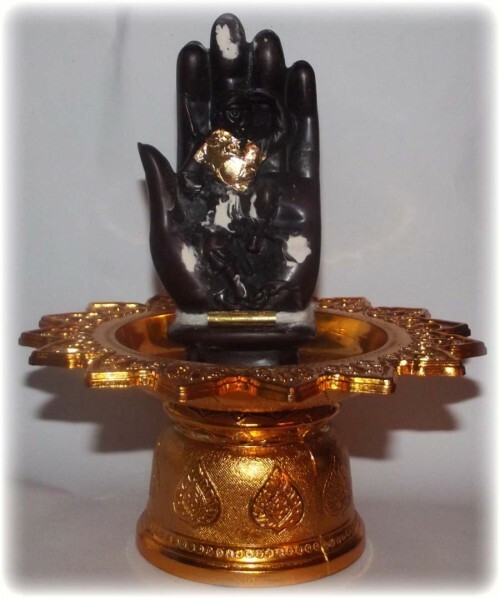 The Mitmor can be used to stir prayer water whilst performing incantations for whatever kind of blessings one may seek to invoke, be they Kong Grapan Chadtri Klaew Klaad, Maha Lap Maha Pokasap, Jerajaa Khaa Khaay, or Metta Maha Niyom Maha Sanaeh. You can use Buddhist Prayers and Candles to perform Holy Water Making, and stir the water in a clean clear bowl with clean clear water in it. 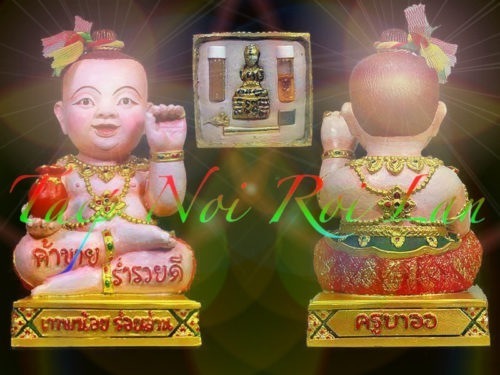 The Edition was spearheaded by the Kumarn Tong Taep Noi Roi Lan 3 Inch wide 5 Inch High Bucha statues, which were released in Ongk Kroo painted colours on Samrit Bronze, with Pong Ya Faed Prai Powders, Kumarn Tong Loi Ongk Statuette, Nam Man Prai, Sariga Bird and Takrut Spell inserted into the base, Only 100 statues were released in Ongk Kroo with painted colours. 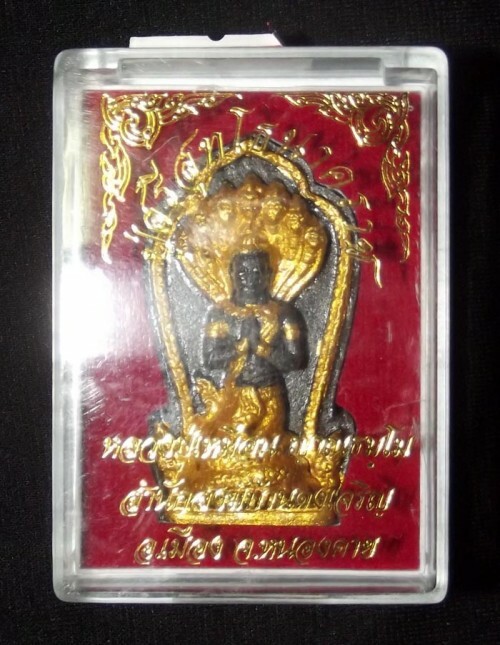 There were also some some Ongk Kroo Pim B in Burnished Bronze (Loha Samrit Lueang), with 3 Takrut (Sam Kasat), Pong Ya Faed, and Look Om Muan Sarn Sacred Powder ball. Only 699 statues were made in Loha Samrit Lueang, with 3 Takrut, Pong Ya Faed Powder Flask, and Look Om Pong Prai Kumarn Powder Ball. 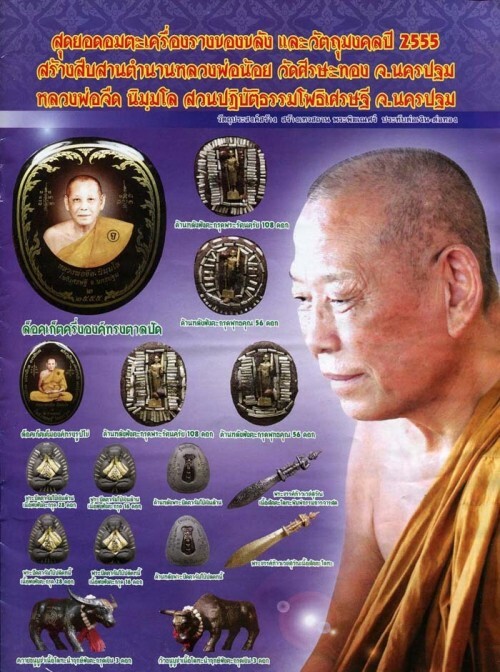 Only 499 Pra Ngang Ongk Kroo Amulets in this 100th Birthday final edition ever made by Kroo Ba Or Bandita, who passed away in his 101st year of Life. Two different models Hun Payont Golem Soldiers were released, in large and small sizes. 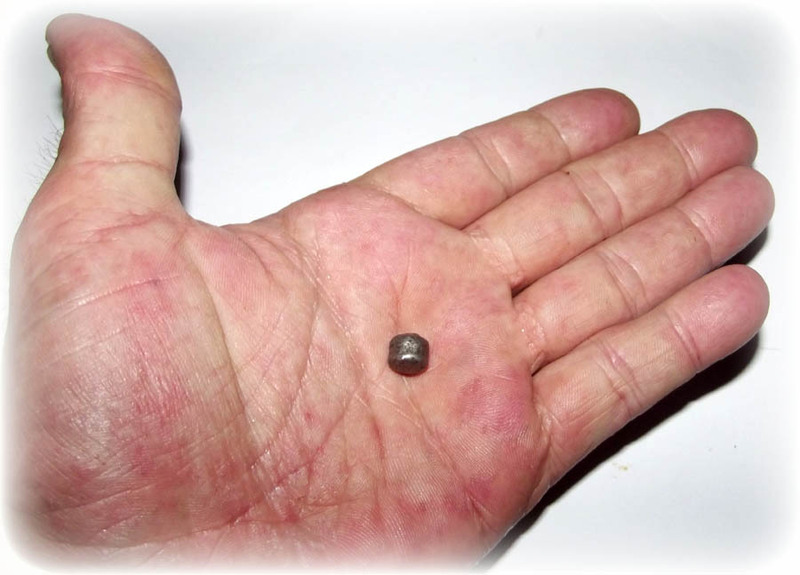 The larger Hun Payont versions were encased in waterproof casing for ease of wear, and measured 5 Centimetres high. Only 499 Hun Payont were made in large size, with varying colours. 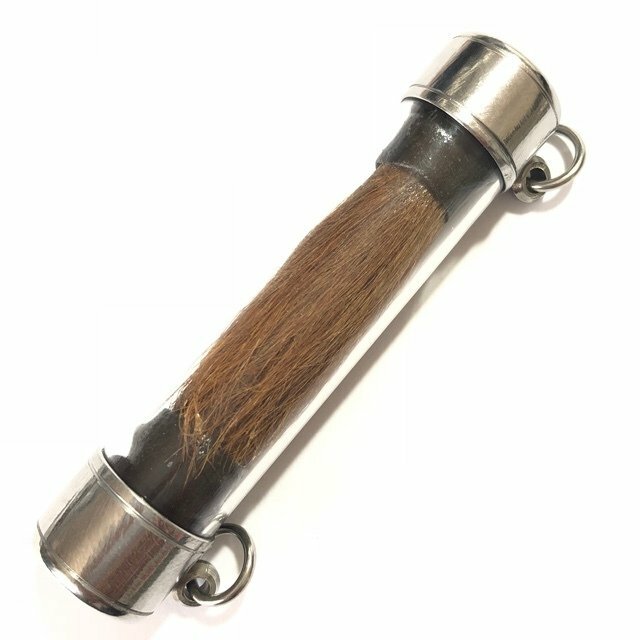 The smaller versions were encased within a cylindrical Takrut tube for portability. Only 699 Hun Payont in small size were made, with colours varying. 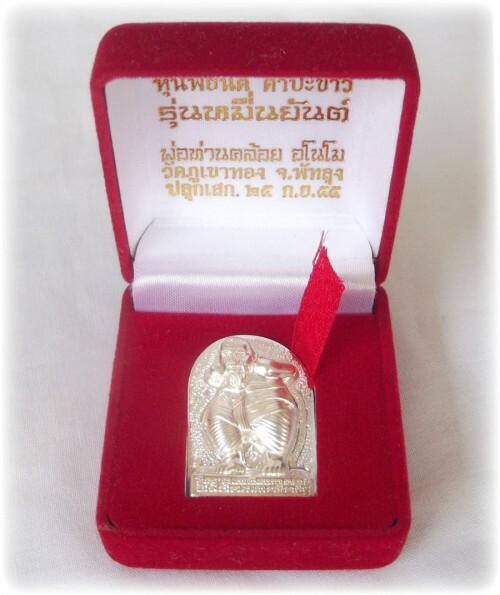 Taw Waes Suwan Gae Pi Chong 2555 BE edition loi ongk statuette amulets by Luang Por Foo Adtipatto of Wat Bang Samak. 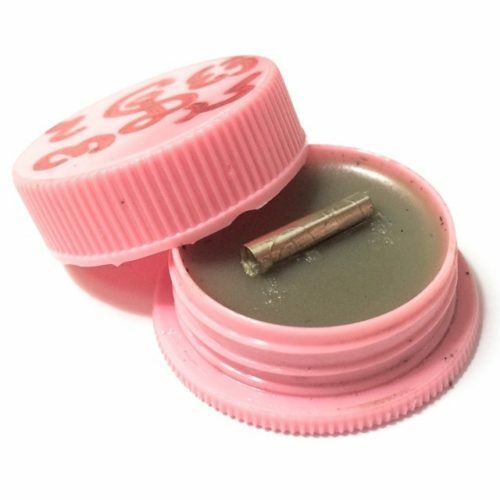 Comes with special decorative casing included. 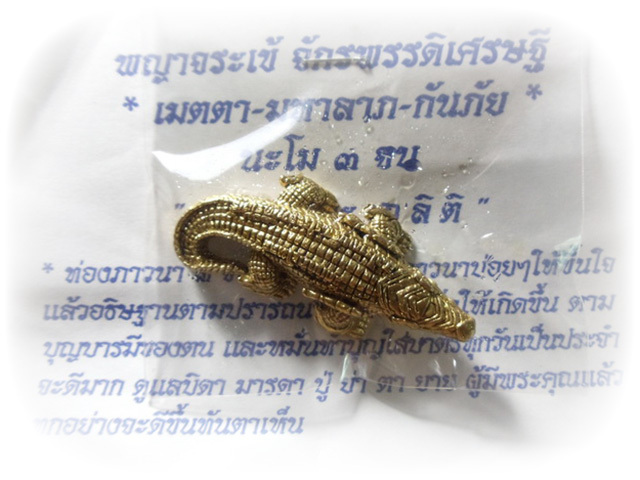 Released in a series of Taw Waes Suwan amulets made in various sacred and precious metals, blessed and empowered by the great Luang Por Foo. 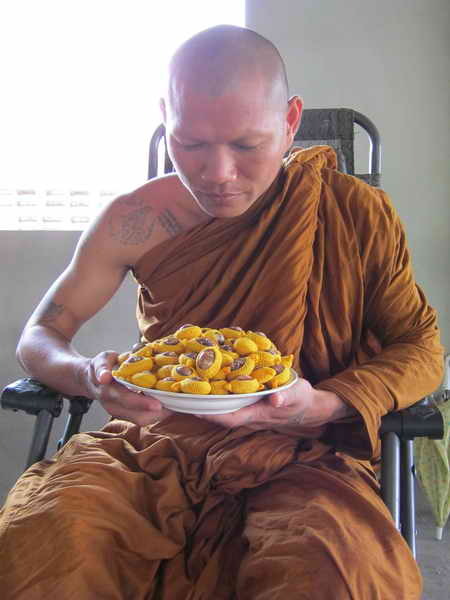 Luang Por Foo is one of Thailand’s Top 5 living masters for the empowerment of Taw Waes Suwan. 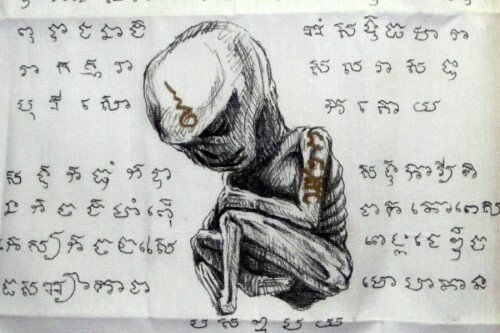 This edition arose because of a good deed of Luang Por Foo; one day some people brought a small boy who was behaving very insanely as if possessed by a demon or ghost, and presented him to Luang Por Foo. Luang Por then placed a Taw Waes Suwan amulet on a chain around the boy’s neck. 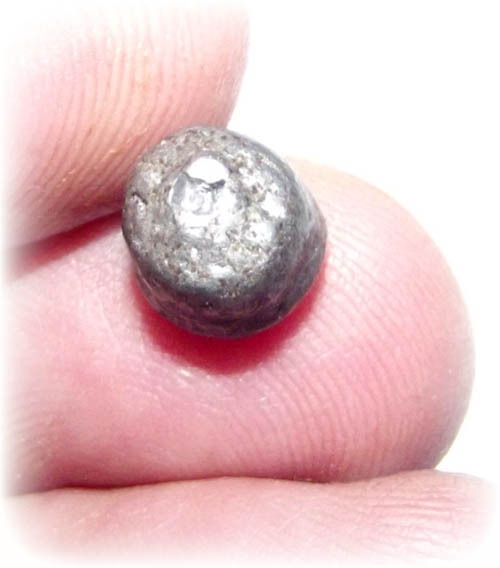 The family then went home, and it appears that the boy was instantly and completely healed. He could sit and talk normally as before. Because of this, the local devotees heard of the story, and flocked to the temple to beg Luang Por for a new edition. The edition was thus made from public demand. Funds from this edition go to the various projects for the preservation and spreading of Buddhism, and to maintain Buddhist temples in need of restoration. 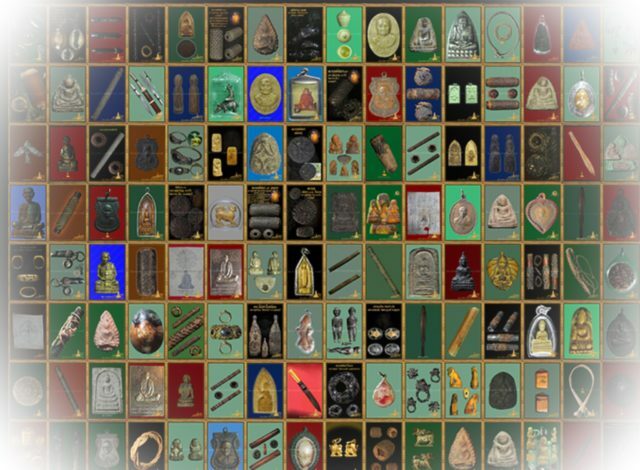 Each different type of model in different metals has an official numbered code stamp and a recorded number of amulets made in official documentation, rendering this as yet another reference standard edition from Luang Por Foo to add to his documented catalog of amulets. 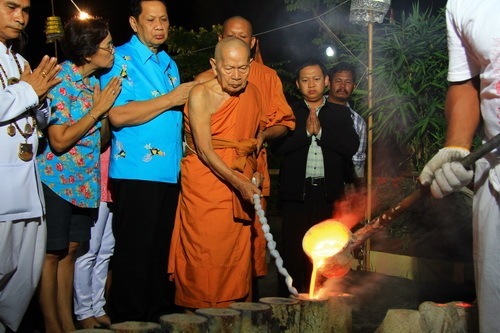 The edition also celebrated Luang Por Foo’s 90th year of life. ‘Gae pi chong’, the name of this edition, means to rectify the karmic and lucky influences of the yearly horoscope for those who have pi chong. Pi chong is the year when one’s starsign falls into inauspicious influences and bad luck sets in, obstacles arise, and money becomes scarce. 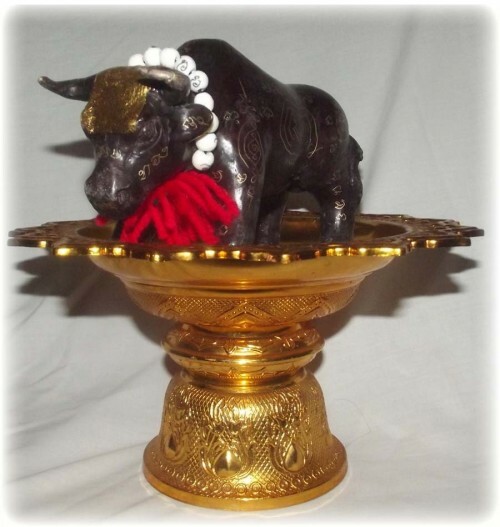 Nuea tong rakang boran nai nam rerk masterpiece version – ud pong fang takrut tong kam 2 dork (sacred ancient temple bell brass alloy with high gold content, from the ‘Nam Rerk’ first casting ceremony, with sacred powders and two solid 24 karat gold takrut in base) – 99 amulets made. 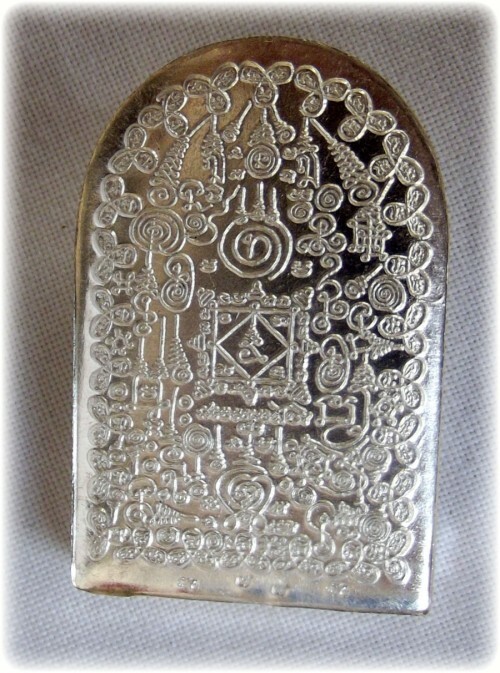 Nuea nava loha ud pong fang takrut ngern 1 dork (nine sacred metals with powders and one silver takrut in base) – 999 amulets made. 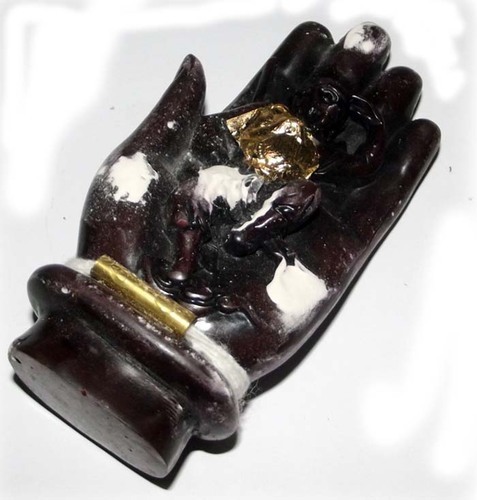 Nuea galai tong ud pong (gold plated sacred bronze with magical powders in base) – 1999 amulets made. 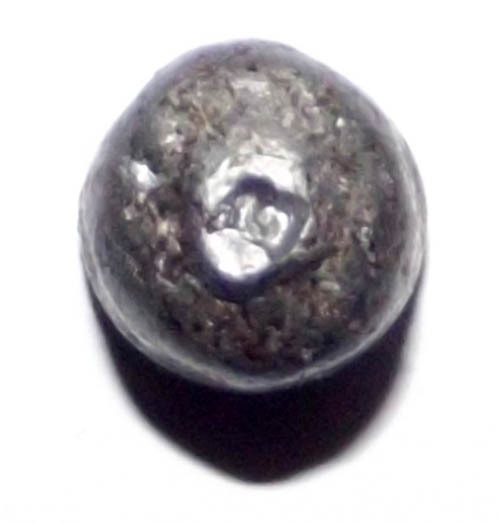 Nuea galai ngern ud pong (sacred silver alloy with magical powders in base) – 1999 amulets made. 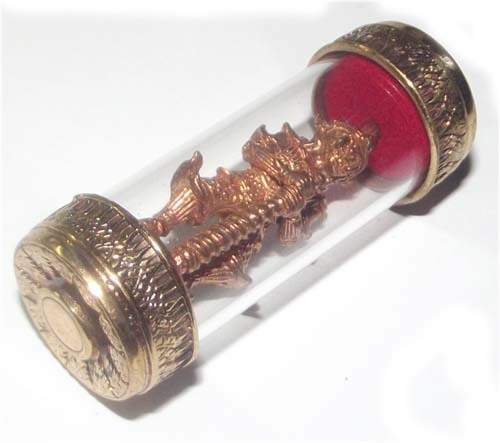 Nuea tong rakang ud pong fang takrut ngern 1 dork (sacred brass alloy with sacred powders and one silver takrut spell inserted) – 3999 amulets made. Nuea samrit ud pong fang takrut ngern 1 dork (sacred bronze alloy with sacred powders and one silver takrut in base) – 3999 amulets made. 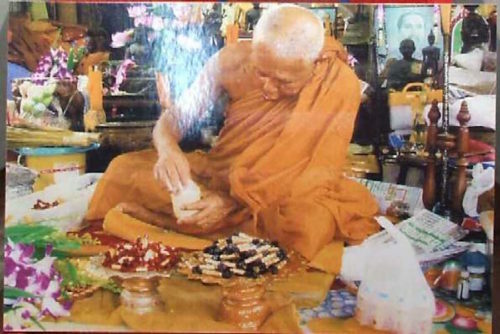 Luang Por Foo performed the pouring of the sacred metals in the official casting ceremony (‘Piti Tae Tong Nam Rerk’) and performed his incantations and special blessings during the ceremony, which consisted of nine chor trees of amulets, with 900+ amulets on them, for the special blessing of the ‘Nam Rerk’ ongk kroo special masterpiece versions. He then stuffed muan sarn powders into them during the ceremony (the other models were done before the ceremony). Luang Por then inserted a solid gold takrut spell into the muan sarn powders within the ongk kroo versions. Pra Ajarn Hnong performed the inspection and counting of the amulets after their final insertion of takrut. 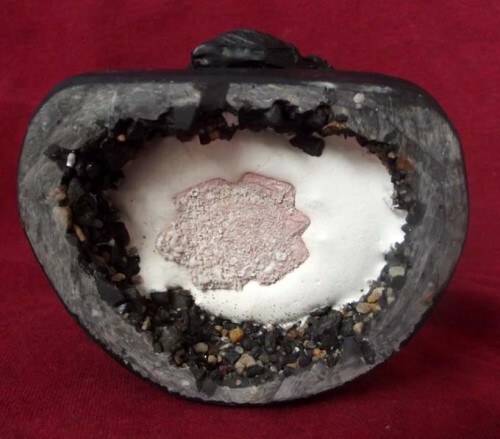 Not many amulets were possible to fill with powders, because the powders were a special sacred powder kept from the 2538 BE ceremony (17 years before the release of this edition). 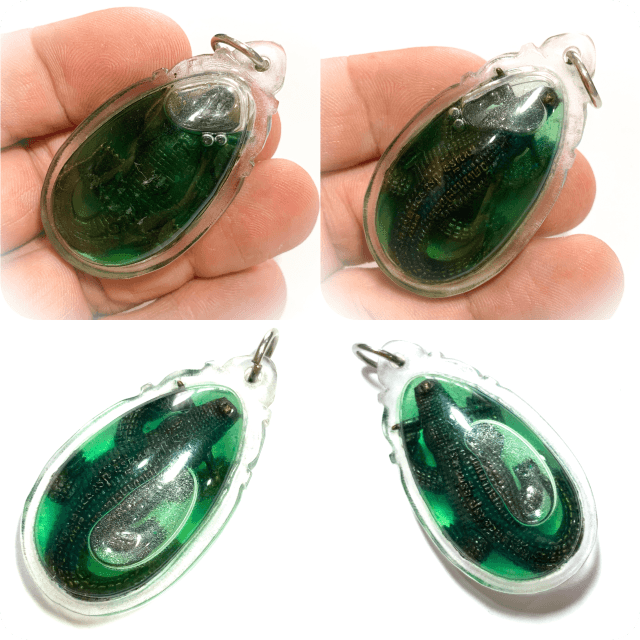 So there were less amulets in final release as originally intended. 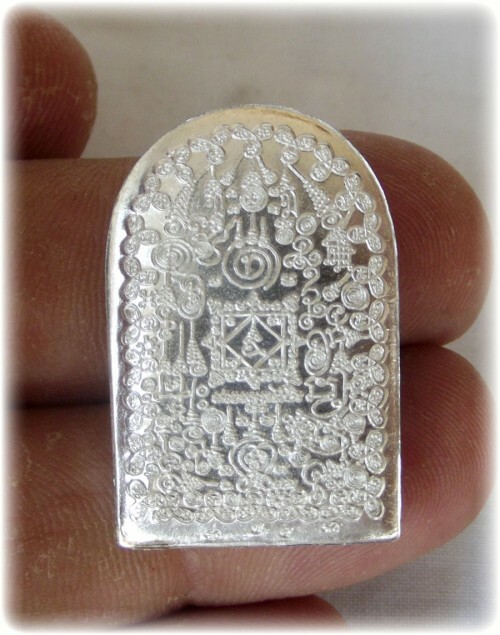 These amulets also enjoy the addition of special powders from the great Luang Por Ding, and very sacred metal alloys cast from a mass of important sacred amulets of past editions and masters, real solid silver and solid gold takrut, and a highly sacred Putta Pisek / Taewa Pisek empowerment ceremony. 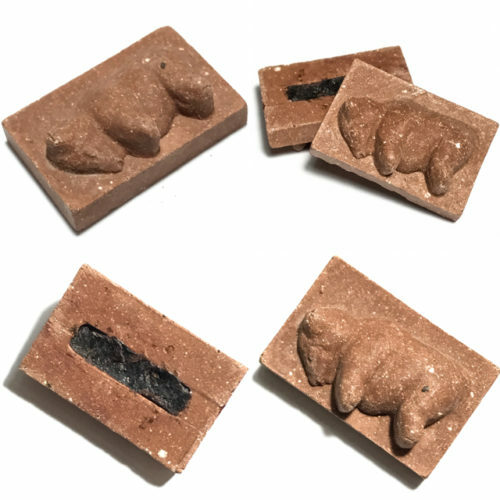 These varied elements provide this edition with a highly respectable status, top quality design and casting, and powerful Buddha magic within them. The Putta Pisek / Taewa Pisek blessing was held on the 14th of October 2555 BE. 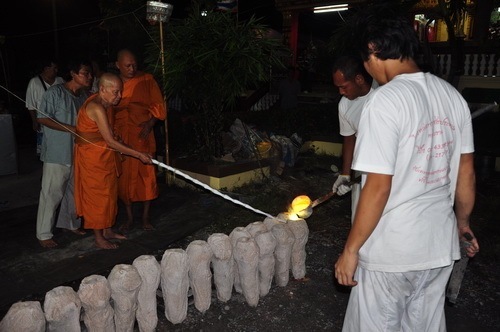 Luang Por Foo performed the lighting of the tian chai victory candle, and the pouring of the first casting. 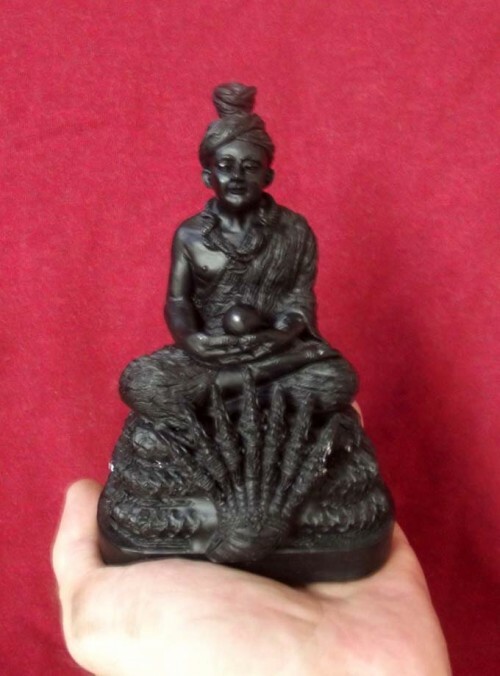 In addition to the amulets, a 15 inch high bucha statue was also released in this edition. 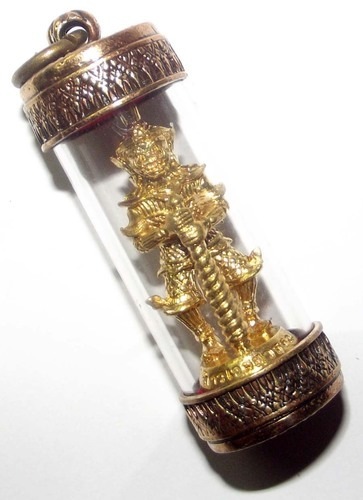 Luang Por said afterwards, that it has been many years since he has attained such a powerful and accomplished invocation and insertion of the heart mantra and mind of the Taw Waes Suwan asura deva into the amulets. He says it is the first time he has managed to make all the powerful lineage aspects of the ritual empowerments be performed to their fullest, be it the use of muan sarn powders of his lineage masters, the yantra within the takrut, the casting and blessing ceremony, and the necessary requirements for the making of the sacred metals. All facets of the wicha were performed according how the ancient wicha dictates. The amulets come encased with special decorative casing, ready for wear and bucha. Luang Por Foo’s mastery of the wicha ‘Suun Phii Lai Phii’, and his adept control of the kata ‘Pra Jao Sip Hok Pra Ongk’ (16 Buddhas invocation) is legendary. He is the most prominent disciple of the great Luang Por Ding of Wat Bang Wua. 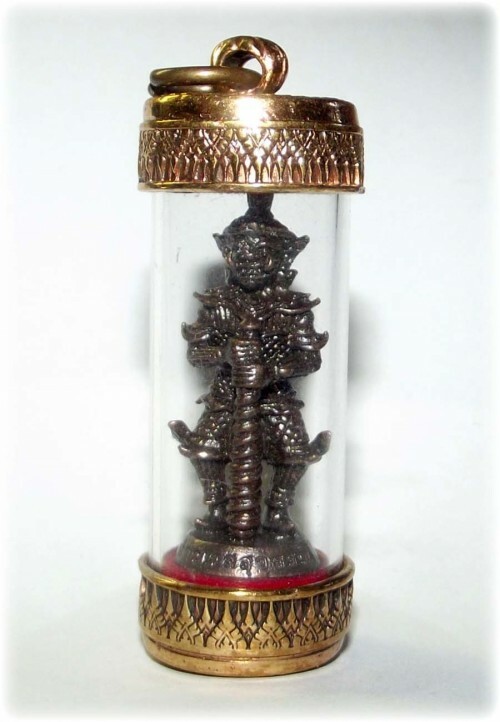 He has mastered the methods of empowerment and invocation to imbue amulets with the mental powers and qualities of the asura deva king Lord Waes Suwan. His importance and connection with this kind of Buddha magic is so great, that he was begged to preside over last year’s great classic edition of Taw Waes Suwan statues in the ‘Tri Plab Pela’ (three legged Taw Waes Suwan) series. 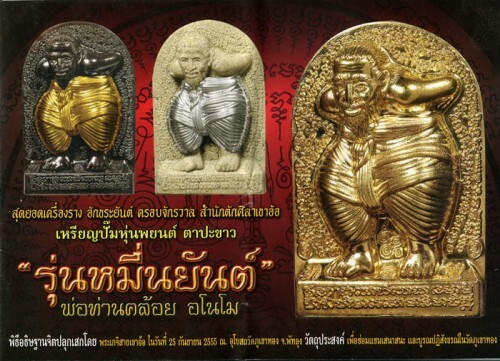 These statues are considered to be the next greatly admired edition by future generations, comparable to the most famous of all; the Wat Sutat Taw Waes Suwan amulet of Jao Khun Sonti. Taw Waes Suwan is the lord and master of all monsters (asura and yaksa), demons and ghosts. The wealthy king is a millionaire of great status, the wealths of all the four asura kings of the ‘Jadtu Maha Rachiga’ celestial heaven. He commands and forbids the demons to stay away from his devotees, and those who are devotees of the Lord Buddha. He is the lord who brought the yaksa minions to hear the Dhamma sermons of Lord Buddha, and who converted the yaksa (or at least most of them) into devotees and followers of the Buddha. 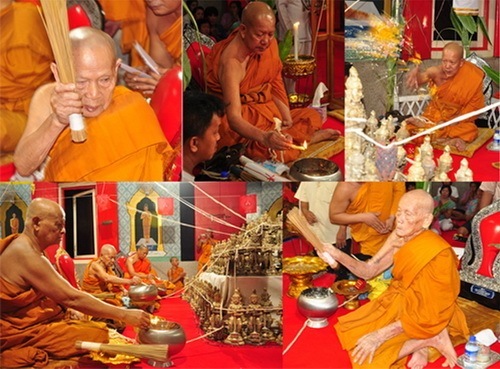 Taw Waes Suwan also donated the magical incantation of the Aadtaanaadtiya Paritta to the bhikkhus (monks) in the forest, to protect them from demons and maras. The incantation of the kata forbids any demons or ghosts or malevolent presences from entering and bothering, and commands them to take their leave. 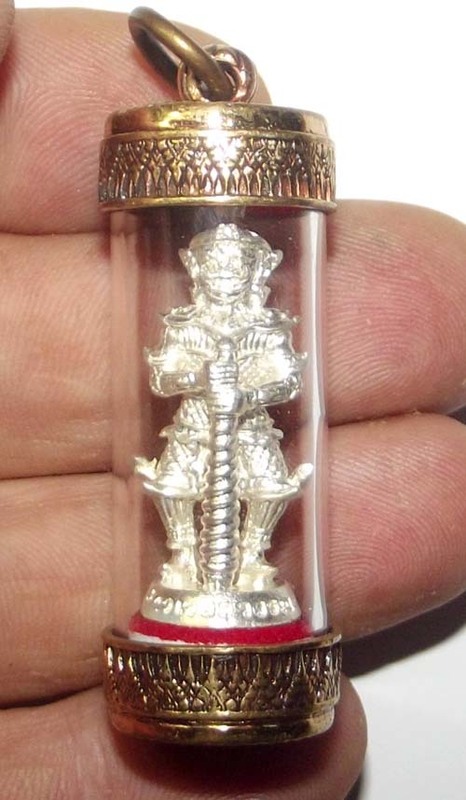 Luang Por Foo has released various editions of Taw Waes Suwan amulets over the years, along with his other famous wicha of the ‘Ling Jab Hlak’ / Hanuman amulet. 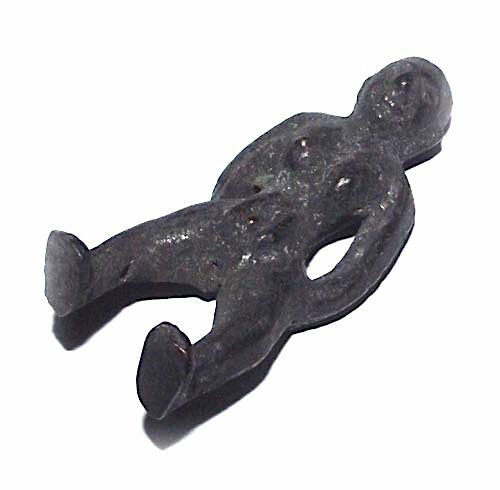 His amulets have received constant interest and documentation by the collectors and expert amulet community, and are now published in their own books as documentations of his trajectory and amulet editions. 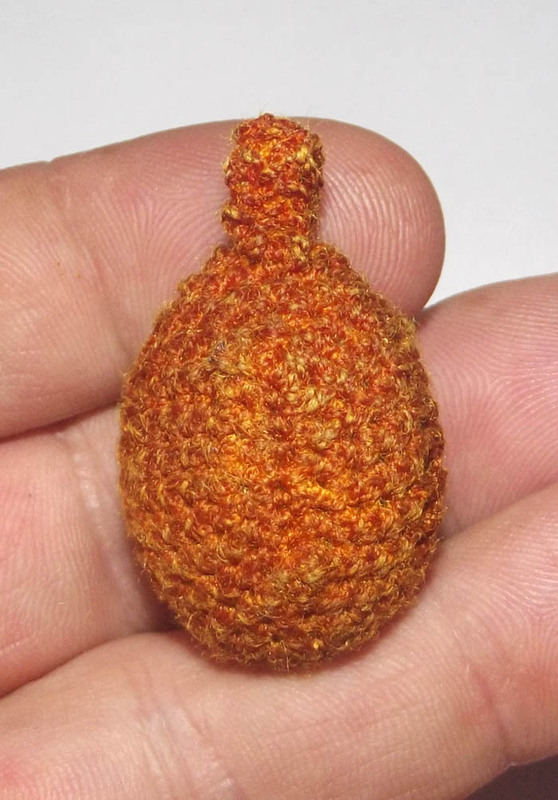 This is always a sign that a monk’s amulets are to become eternal collectible classics of high repute. 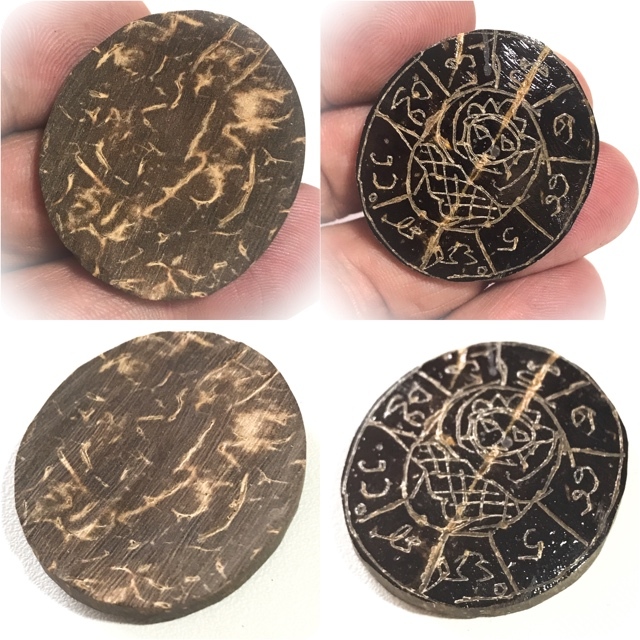 This is because, apart from miracles occurring, the one other thing that makes an edition famous and collectible (and sometimes expensive), is whether the amulet has easy to find information about the making and various models, and identification marks, or not. Above: the prequel ritual to invite the devas (‘piti anchern taewada’) performed by a Brahman with Luang Por Foo in attendance. Waesa Pusa Puttang Arahang Putto Taw Waes Suwanno Na Mo Puttaaya. 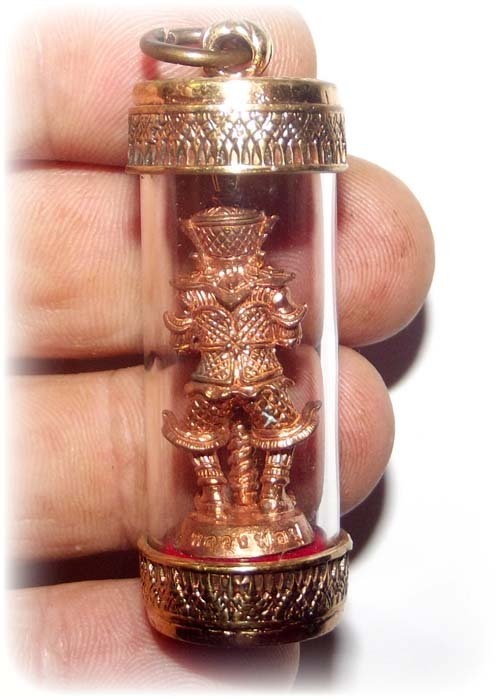 Wua tanu fai is a truly ancient style animist spirit charm by the master of the devotees of the Thai-Burma Mon and Karen hill tribe people, Luang Por Kane ‘Duang Gaew Sivali’, of Wat Kho Phu. 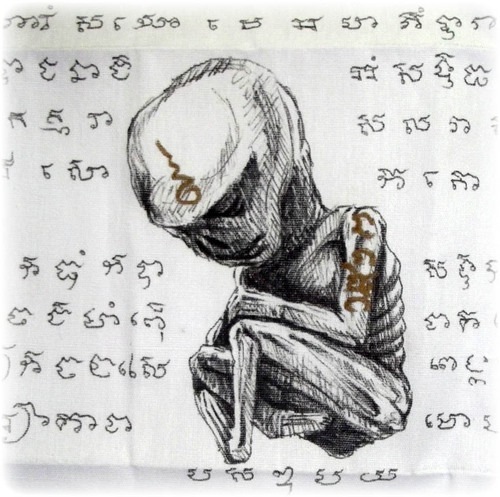 This sacred earths effigy is hand moulded, inscribed with Khom spells and empowered all individually by the hand of Luang Por Kane. 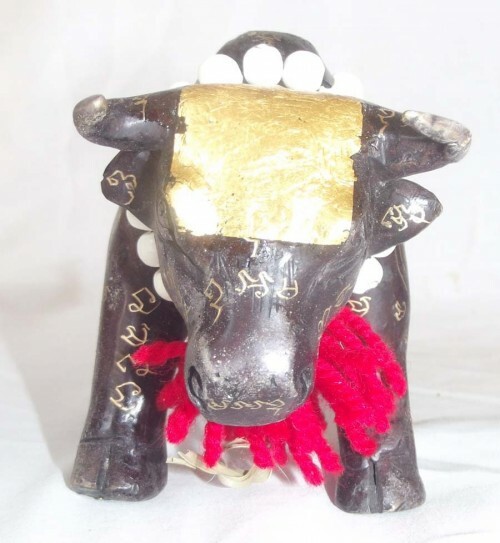 This wua tanu is empowered to burn all evil and dark magic to ashes with its spiritual fire element. 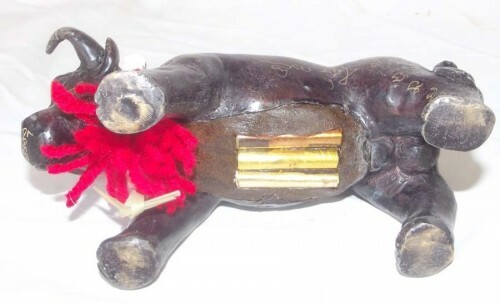 Using fire kasina to imbue the wua tanu with incredible power to completely eradicate with a fiery gaze that emits a burning beam of energy as it looks around to guard the perimeter around you and your household, business and treasures. 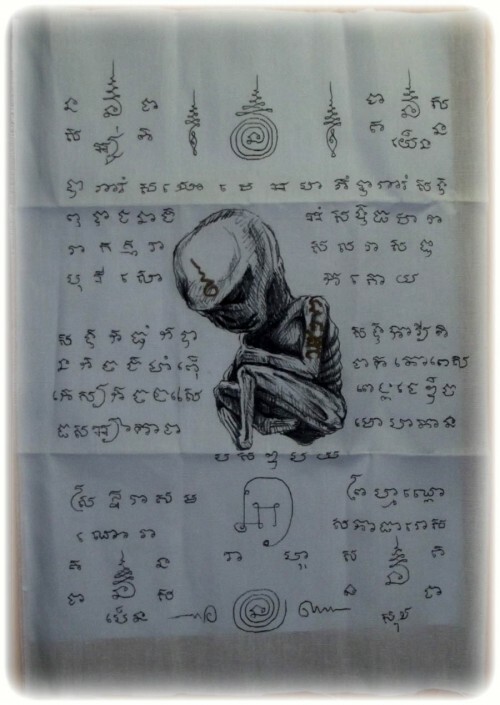 The muan sarn for the wua tanu is composed of a large array of sacred earths, including pong look krok wua tanu (powdered arrow bull stillborn), Taw Waes Suwan powders, yant ‘Wua Tanu Tone Jet Gamlang Chang Sarn’, giant termite nest powders of 7 nests, 7 cemetery earths, khui pu (sandballs made by crabs) from 7 beaches, 7 swamps, krang Putsa paste from 7 Putsa trees that died as a prai, takrai sema (pieces of old temple wall and sacred stone ruins), pong hnang wua fa pha (powdered bull skin that was killed by a lightning bolt), powdered bones and horns of a bull that charged and killed a human being, and earths from 7 ports. 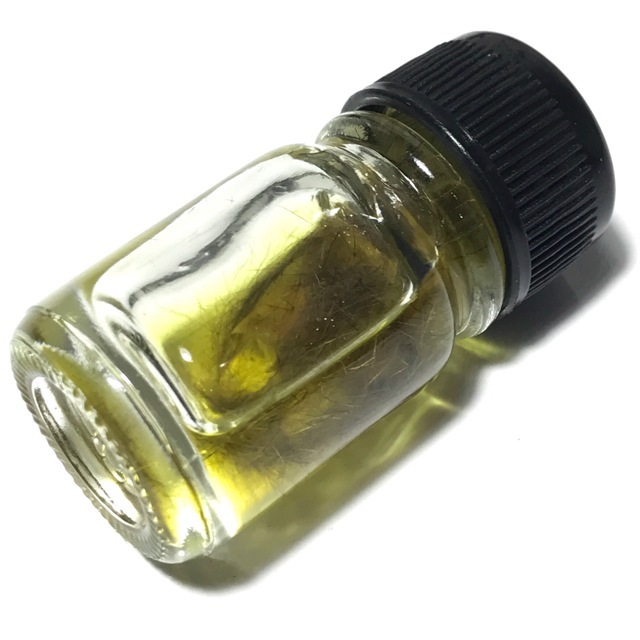 These ingredients were ground up into one powder and empowered as pong wua tanu fai. This was then further strengthened with the addition of wan Mahesworn herb, bringing power, and strength of victory. 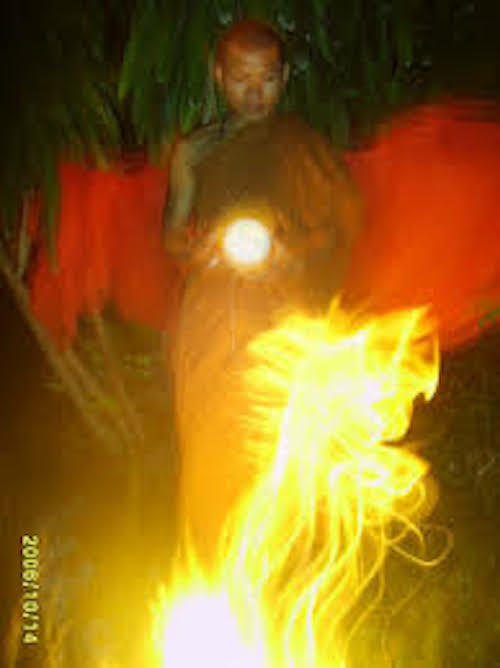 Luang Por Kane performed a mass empowerment of the wua tanu under the full moon, invoking the 4 elements and the kata ‘Akarn 32’ for the complete reanimation and awakening of the spirits within the wua tanu effigies. Luang Por stared kasina powers into them until he recieved the nimitta of the wua tanu. 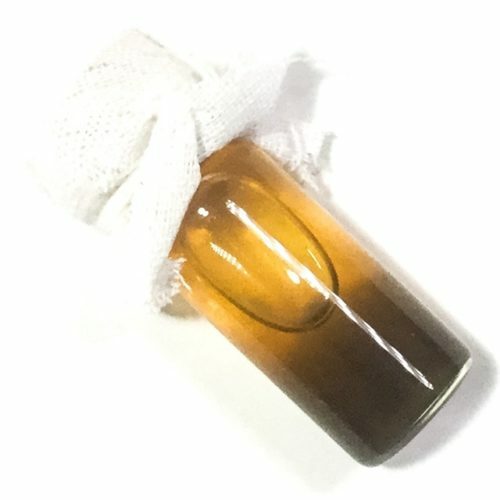 You can either use the wua tanu on a bucha tray (‘pan kroo’), or altar, to watch the house during your absence, and also worn, or carried, to take with you for protection or entering into places where much dark magic is present, such as the jungles and forests, mountainous wilderness and caves. Always make sure any Buddha images are placed higher than the wua tanu, be it on the altar or worn. 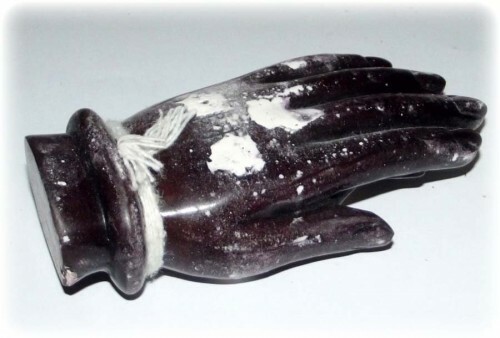 If there is black magic or curses attacking you, problems occurring enemies or ghosts and demons are bothering, then chant the kata ‘Wua Tanu Fai’ 3 times and pray for assistance to the wua tanu, and the problems will be met by the wua tanu who will send them back to where they came from or burn them to cinders with its gaze. To use on the altar, give offerings of water and seven blades/leaves of hay or grass on a Tuesdays and on Buddhist holy days. Enemies who attack will end up suffering the same thing they tried to commit against you, as the wua tanu sends all curses and evils back to their origin, to attack their own maker. 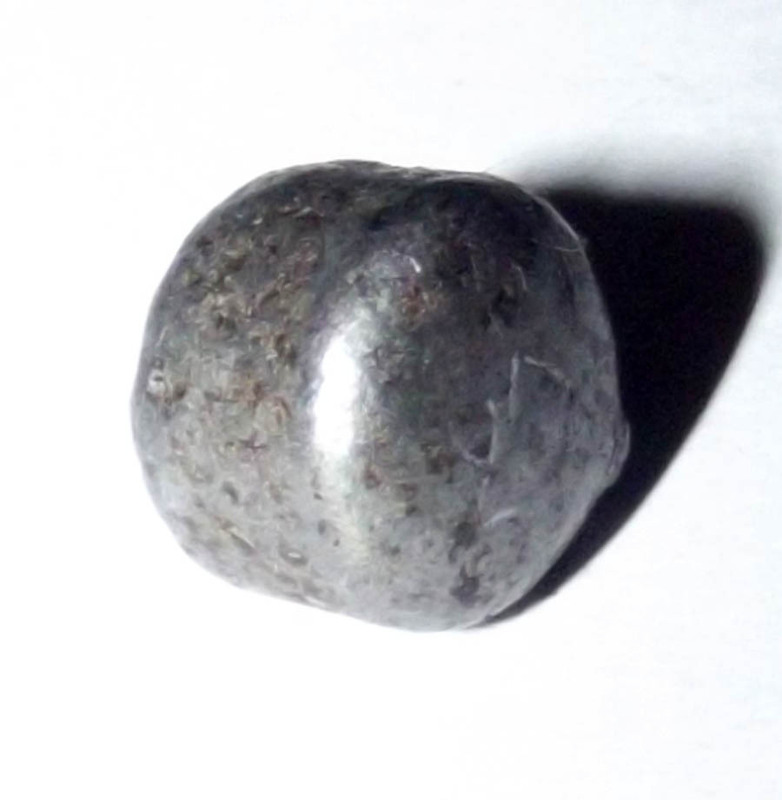 This also then stops any bad luck that may have been blocking the lucky influences from entering by removing any black magic or other obstacles, and calling in wealth and lucky events. 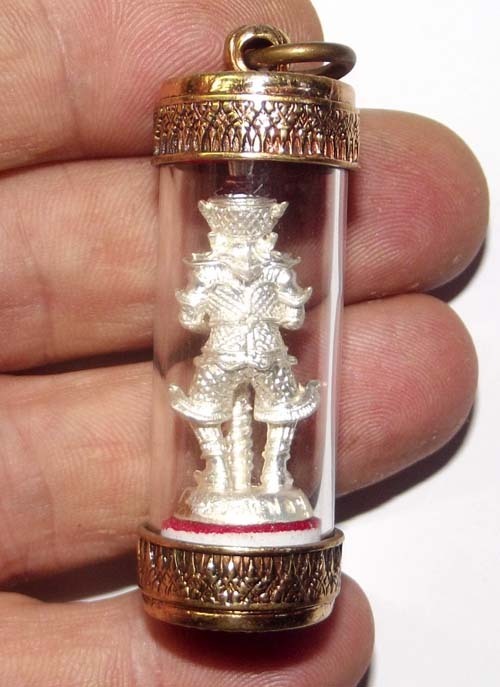 The wua tanu is in Thailand an essential magical assistant for houses that are on the edge of forests or jungles, on a T-junction or a fork in the road, or where the local spirits are very powerful and not always benevolent, and easily angered. 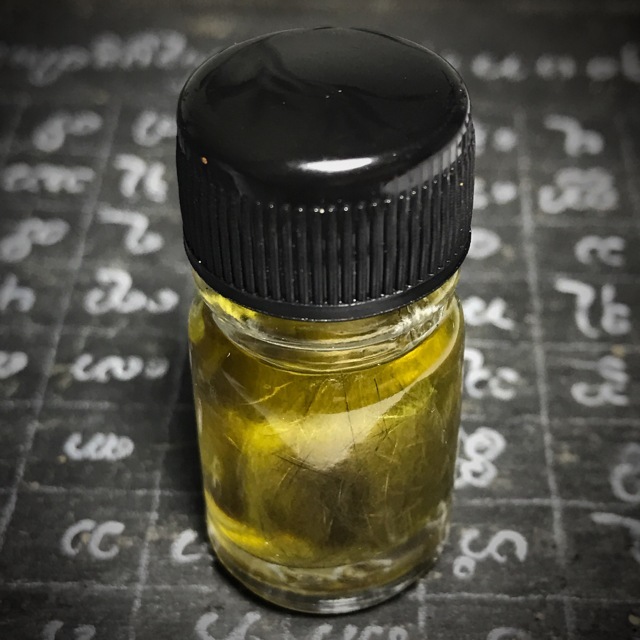 If you have a household in one of these situations then the wua tanu is an especially recommended protective spell to eliminate inauspicious influences. 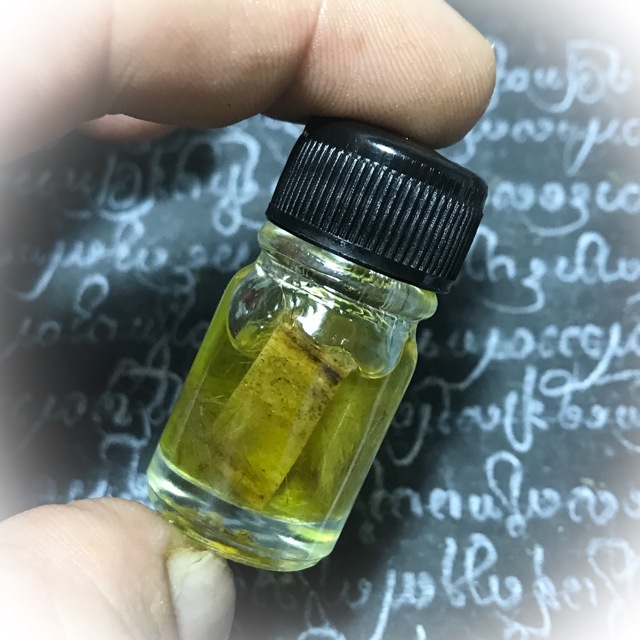 Anybody who needs to protect their valuables, or to defend themselves agains black magic, will do well with Luang Por Kane’s authentic sorcerous earths original ancient wicha magical ‘Wua Tanu Fai’. Luang Por Kane is recognized amongst those in the know, and by us too, as one of the truly powerful sorceror monks of this era, whose kumarn tong are not less powerful than those of the great, one and only Luang Por Dte of Wat Sam Ngam, who is now superceded by the great Luang Phu Yaem, who is also considered by most people to be Thailand’s number one kumarn tong master. 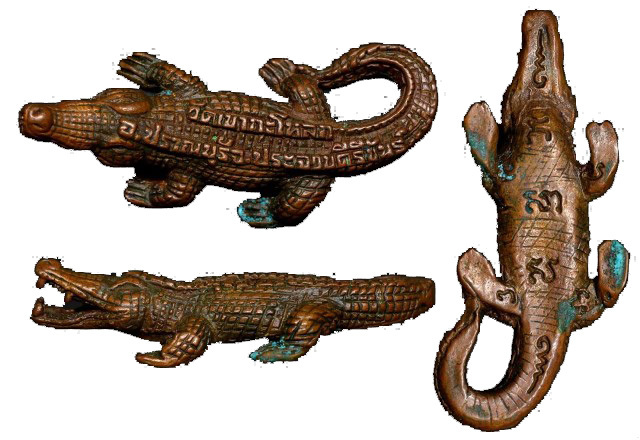 In truth, we feel that although we speak of mastery of the adept class, that Luang Por Kane’s original and still item-for-item hand empowered sacred earth amulets and kumarn effigies, have the edge, and are much more reminiscent of the primitive looking kumarn and other amulets of the great Luang Por Dte, than those of Luang Por Yaem. 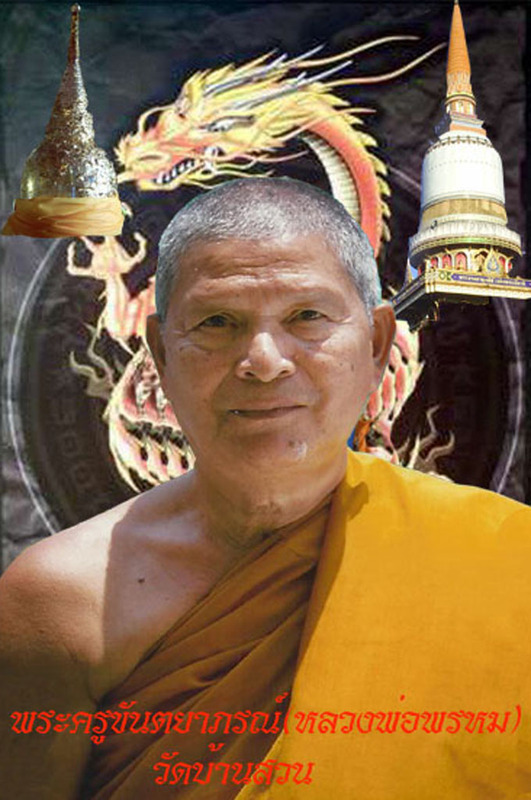 In whatever case, or whoever you yourself find to be the more evident master, Luang Por Kane is our personal choice of kumarn tong master in the vote for the country’s number one necromancer. 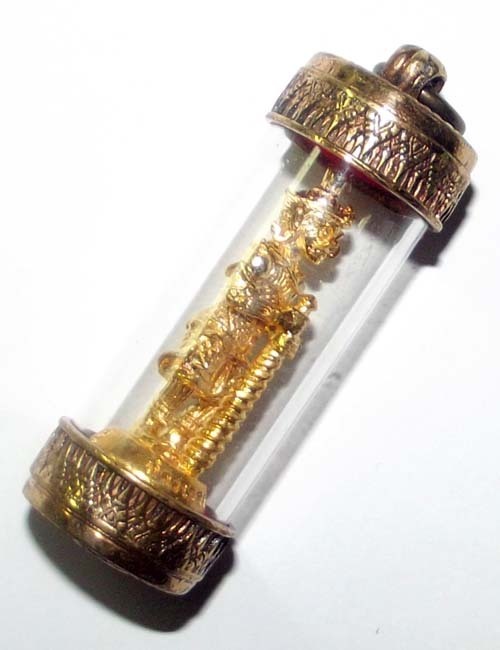 If we were to dither and doubt as to which other master could possible have as much power as Luang Por Kane for this type of ancient animist or necromantic amulet, we would perhaps name Luang Por Dam of Wat Pra Puttabat, whose kumarn tong are also of the finest that can be found in the present era. 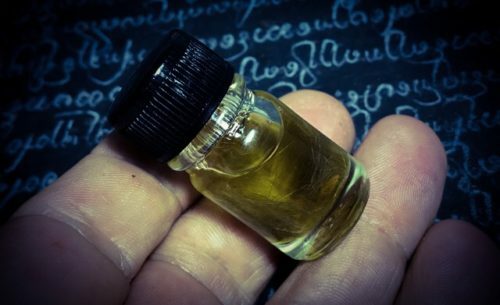 Luang Por Kane’s sorcery is ancient and primal, and animist magic is at its most powerful when it is allowed to emanate through its most promal fashion, not need for fancy or modern looks or decoration. 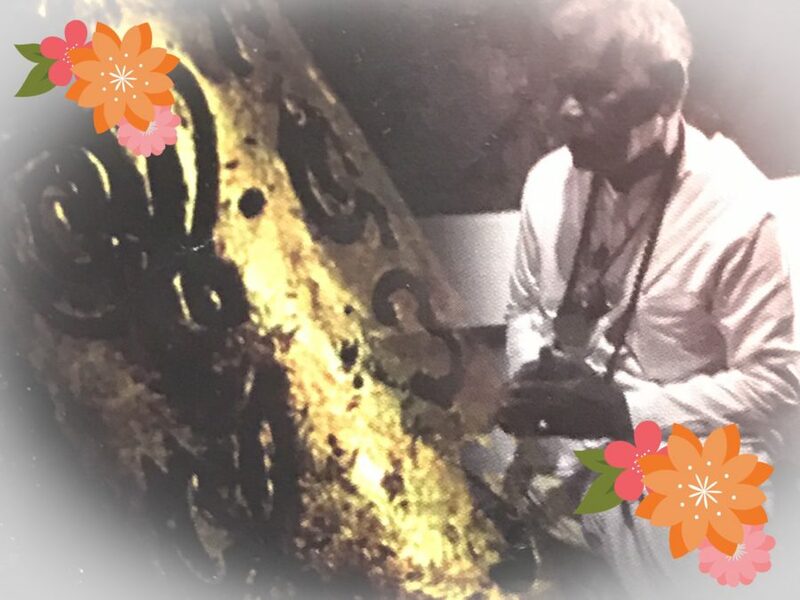 We admire his adherence to the act of personal involvement with the making of the effigies and the mixing and empowerment of the muan sarn, and hand inscription, with invocations of the wua tanu fai spirit deva, and subsequent empowerment with incantations of reanimation spells. 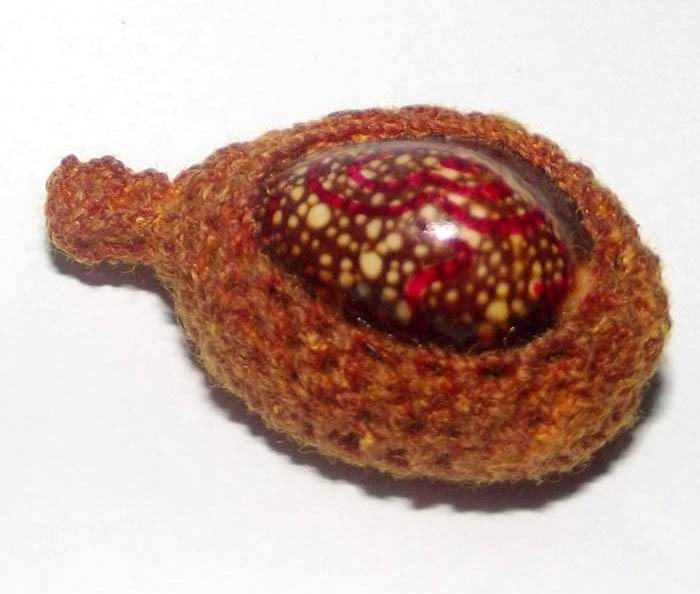 You can ask the wua tanu to bring good business, lottery and lucky fortunes as one of its blessings too, so is not only a protective amulet, but indeed also a magical source of increased prosperity, possessing choke lap and maha pokasap (‘Dood Sap’) power, as an added benefit. 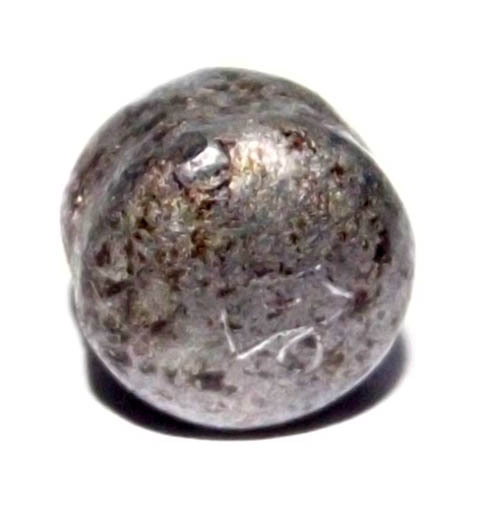 For perfect house protection put 4 wua tanu in the earth, one in each of the four corners of your house, or of your land. The four cardinal points also are valid to use. If four are used, they cover all four directions better and do not have to turn from side to side, leaving corners unwatched. 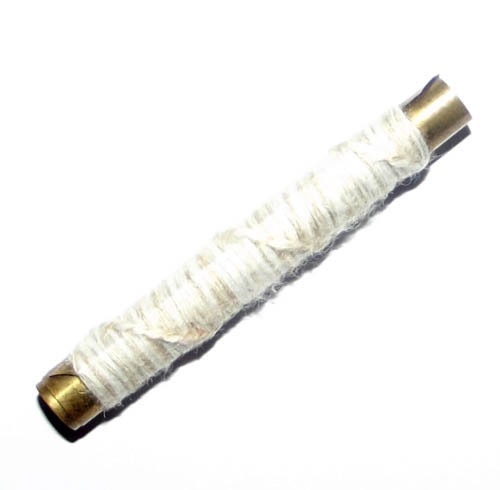 This is the traditional method of using wua tanu to protect from outside of the house to protect the grounds of the house and keep evil forces even further away from the home. Always chant the ‘Maha Namasakara’ first before chanting the kata ‘Wua Tanu’ if you are Buddhist. If you are Hindu then perform your usual poojahs or chalisa to your allocated deity first and then perform the kata for the wua tanu. If you are Muslim, then say your prayer to Allah first, before chanting to the wua tanu. Om Ko No Ko No. Then make your request as a prayer and wish to the wua tanu. Na Ma Na A – Nor Gor Na Ga – Gor Or Nor A – Na A Ga Ang (3 times). Om Kono Kono Wua Tanu Gao Pan Waa Saay Dtaa Gao Pan Muay Tiaw Plaay Duay Tuk Kam Chao Bpen Jao Gae Fhoong Phii Tang Hlaay Puudt Phii Lae Phii Prai Chin Hai Dtaay Ya Hai La Thoi Ju Lai Ju Sitti Puttang Sitti Tammang Sitti Sangkang Sitti Swaaha Pa Ta Na Ma. 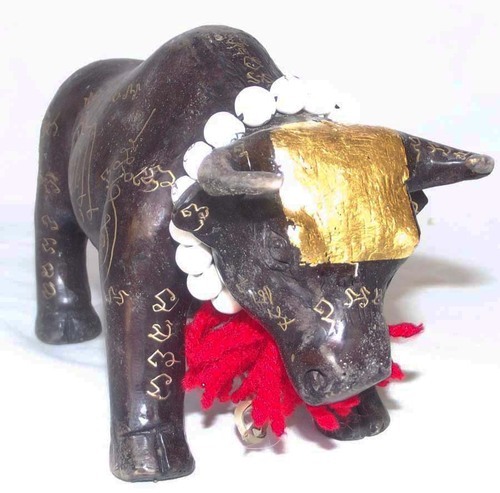 Wua Tanu (‘Ongk Kroo’ version with 3 takrut) – 3 inches wide front leg span, 4 inches wide horns, 6.5 inches long, 4 inches high. 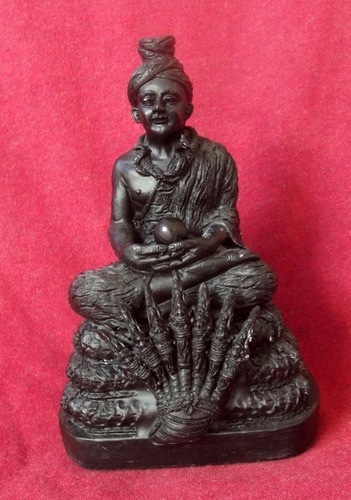 Buddhist/animist bucha statue to ward off black magic, afford protection and attract wealth (and gambling success). 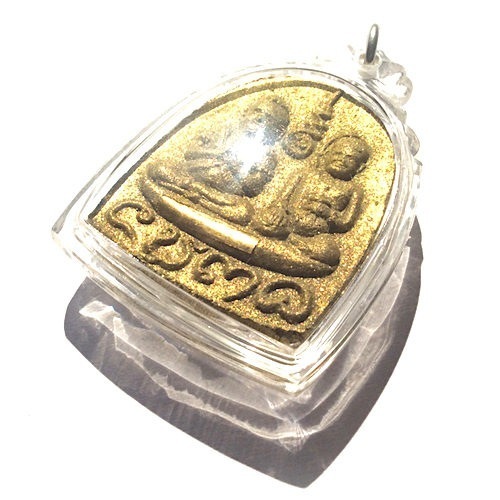 Wua Tanu bucha statue from Luang Por Jerd comes as a special and highly expected edition of the most exquisite fine masterpiece amulets and bucha statues that Luang Por has ever made. 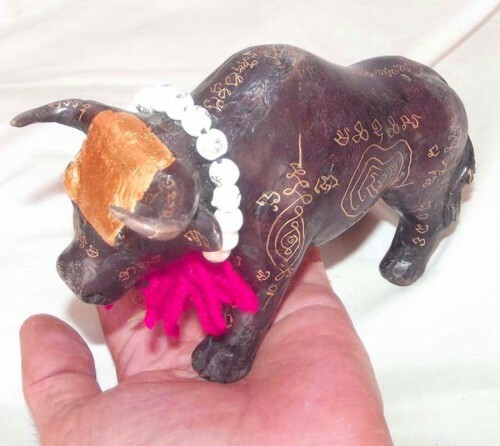 The Wua Tanu is a powerful guardian and bringer of sustenance, as well as a very aggressive protector against black magic, ill wishers, and thieves. The statue measures 4.5 inches wide at the horns, (3 inches leg span), and is the ‘Pim B’ model of two models in this size. The temple states this is a 3 inch bucha, which we find confusing seeing as the span between the horns is 4.5 inches, in comparison to the space between the front hooves which is 3 inches. The widest part of the statue is however, 4 inches. 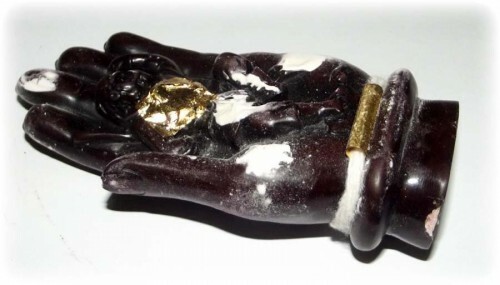 This ‘Pim A’ Wua Tanu bucha statue, is endowed with three golden takrut spells inserted in muan sarn powders and krang putsa resin paste of the belly. ‘Prakam graduk kwai’ (Buffalo horn rosary), is tied around the neck. 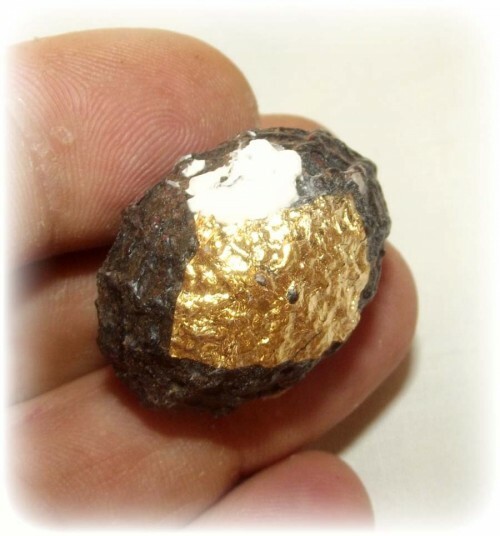 The forehead of the Wua Tanu has a gold leaf final Blessing. 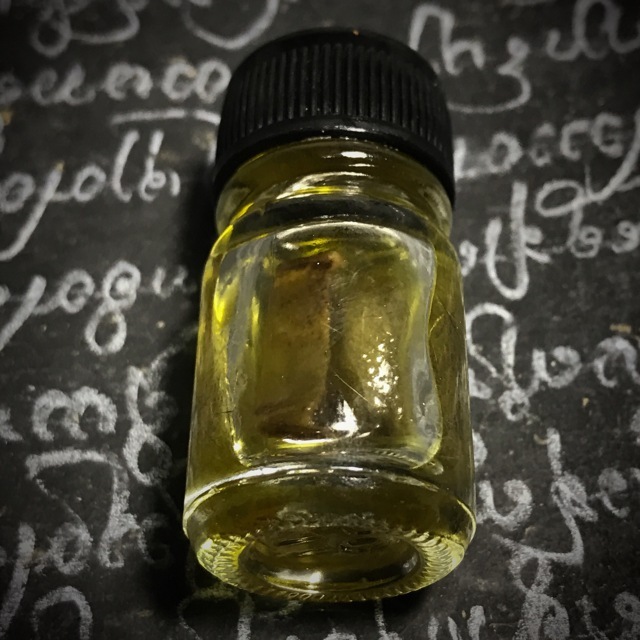 Instilled with powerful anti black magic and protective spells to prevent thieves, demons, sorcery and curses from entering the household or vicinity around them. If you are a luxury model collector, then this is the model you seek, the ‘Ongk Kroo’ version. 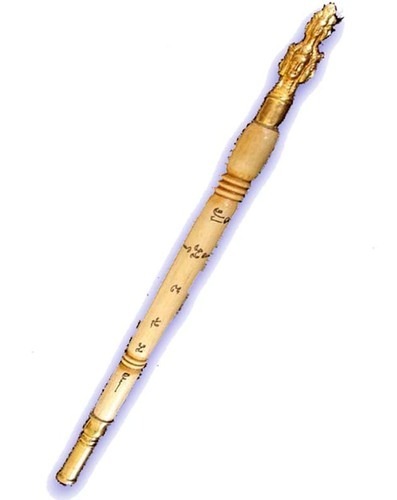 The ongk kroo comes with a rosary around its neck, and hand inscription. 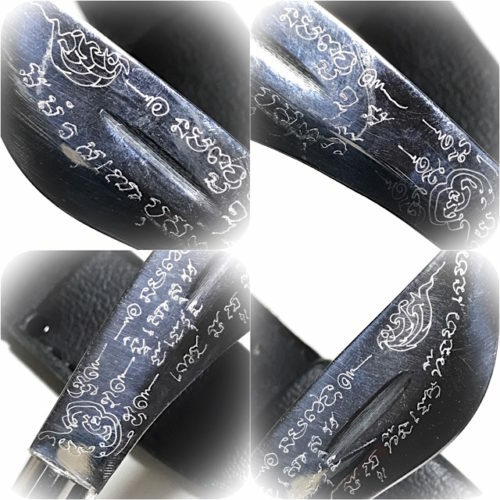 The standard ‘Pim B Pised’ model differs in that it has embossed Agkhara and yant, whereas this ongk kroo has hand engraved inscription from Luang Por using engraving tool. The hand inscription was performed during the Puttapisek blessing ceremony. The horns span 4 inches wide. These ‘Pim A Ongk Kroo’ masterpiece versions of the Wua Tanu have a hand inscribed prayer rosary made from bone around their necks, and gold leaf blessing on the forehead. 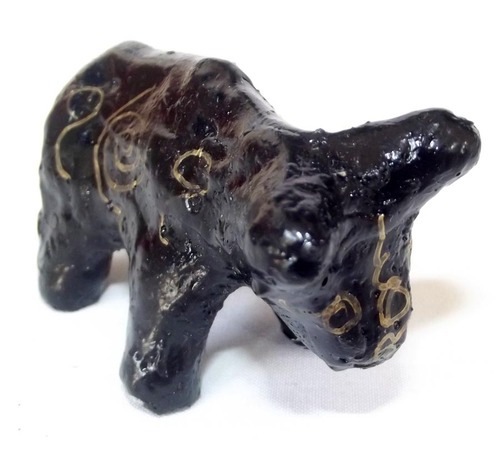 A powerful protector against black magic and house invadors, as well as a strong attractor of wealth and treasures. 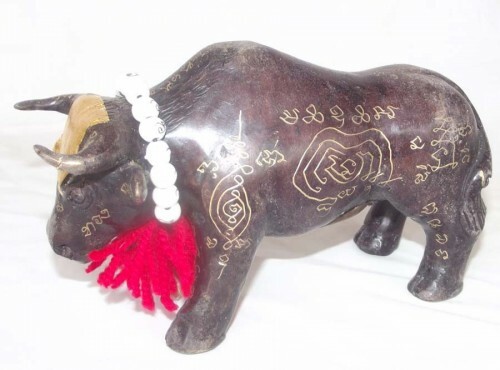 The bucha statues were made available as ‘Wua Tanu’ (holy bull), or as ‘Kwai Tanu’ (sacred buffalo). There are eight different versions in all, which were made in two different sizes, in 3 inch wide or 5 inch wide bucha statues. Each type and size has an ongk kroo version and a standard version, in each of the two sizes. the ongk kroo masterpiece versions in both 3 inch and 5 inch sizes (of both Wua Tanu and Kwai Tanu), have 3 takrut (3K) inserted. Whereas the standard versions have 1 takrut and ‘phaa saam see’ (tricolored ribbons), instead of the rosary with hand inscription. 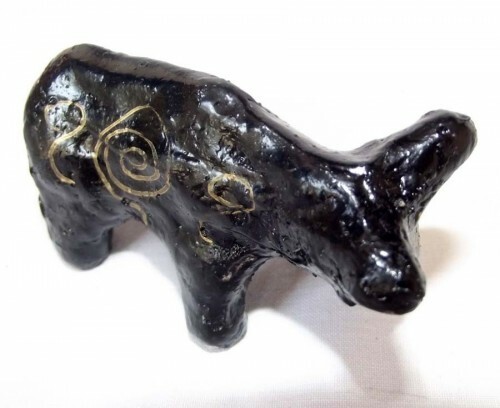 The span between the hooves measures 3 inches wide, with the horn span being 4.5 inches. In addition, these ongk kroo versions have and rosary necklace, with hand inscription on the surface, instead of three colored ribbons. 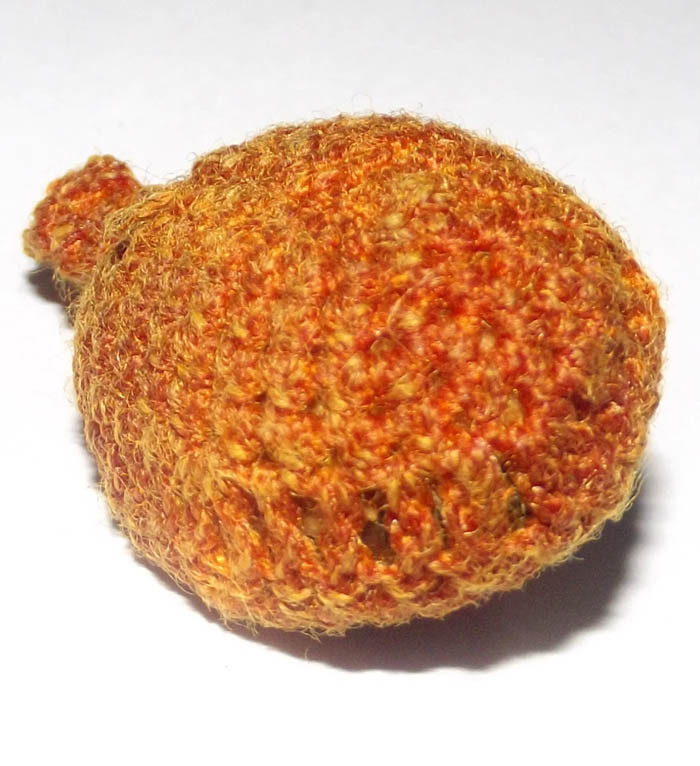 The muan sarn in the belly contains a host of sacred and sorcerous ingredients to empower and increase the potency and power of the Wua Tanu, amongs the most important ingredients were; ‘pong hua jai’ Wua Tanu (heart of the Wua Tanu powders), krang putsa dtaay prai (‘putsa’ paste from a putsa tree that died as a prai, earths from seven cemeteries, earth from seven giant termite mounds, crab sand pellets, broken pieces of temple wall bricks from seven temples, and 108 herbs, woods and pollens. 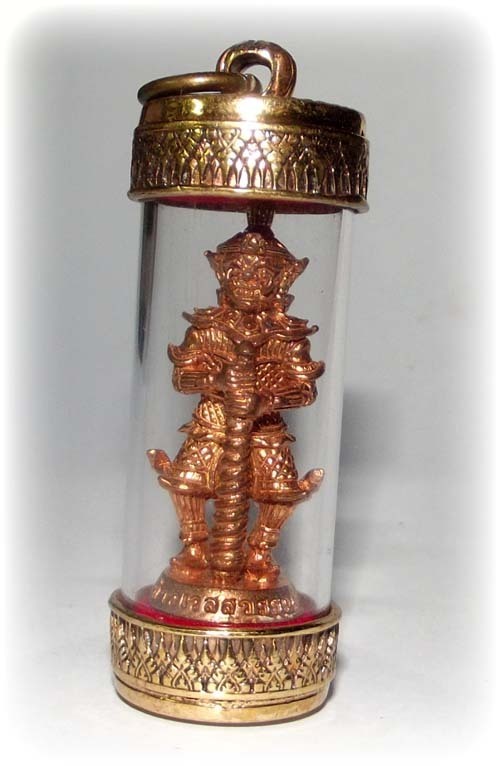 Released in a very special edition of amulets from Luang Por Jerd, which included some extremely luxurious lockets with the image of Luang Por Jerd on the front, and a thick sacred powder filling in the rear face of the amulet, with a Pra Sivali loi ongk statuette and 108 or 56 takrut spells inserted into the muan sarn base formula. 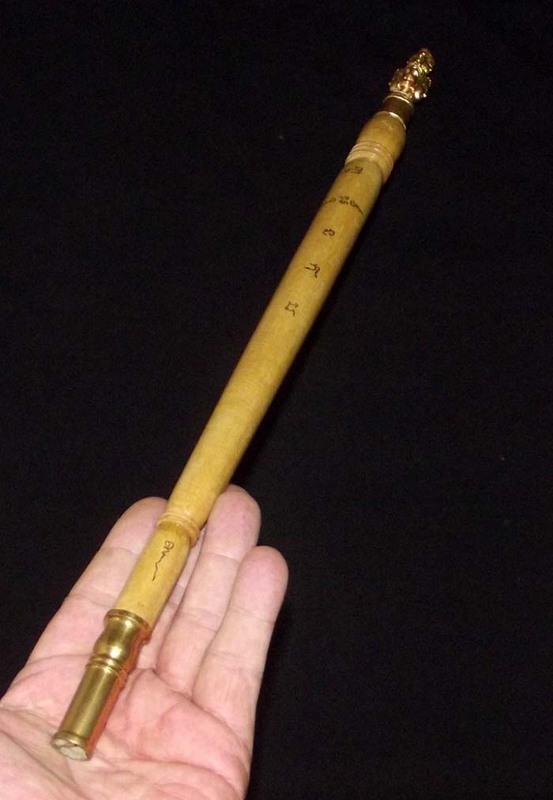 The standard versions of the Wua Tanu (and Kwai Tanu), have one takrut insert in the belly instead of the three takrut found in this ongk kroo verison. 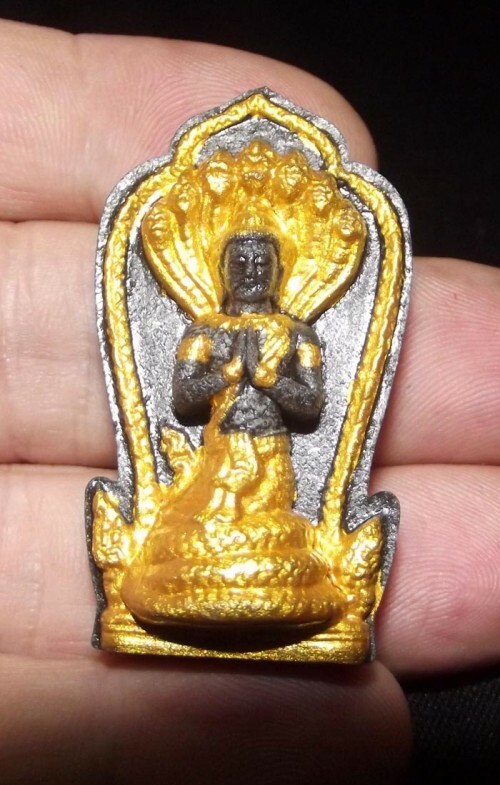 The outer surface of the standard versions of the statues have embossed cast iron yant, and Khom Agkhara in 3D, instead of the hand inscription given to the ongk kroo versions during the blessing ceremony. 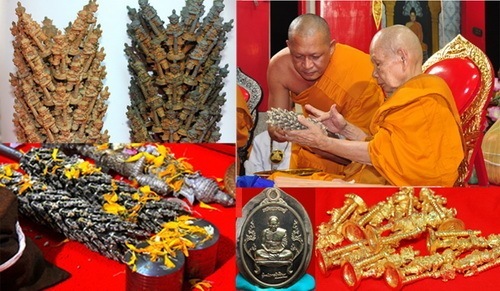 Both versions have recieved so much attention to detail and fine quality chanuan muan sarn (metallic artifact metals) and pong muan sarn (sacred powders), with the empowerments and blessings of a legendery monk of the calibre of Luang Por Jerd, who is the direct looksit and apprentice in magic to Luang Por Noi (famed for his Pra Rahu coconut shell amulets), of Wat Sri Sa Tong. Luang Por is also a prime apprenticed looksit of Luang Por Noi of Wat Dhamma Sala as well, from whom he learned another large number of wicha. The purpose of this edition was to raise funds for the building of a ‘taewa sathaan’ (deity shrine) with a large statue of Pra Pikanes (Ganesha) sitting on a pair of gold and a silver treasure bees as his throne. 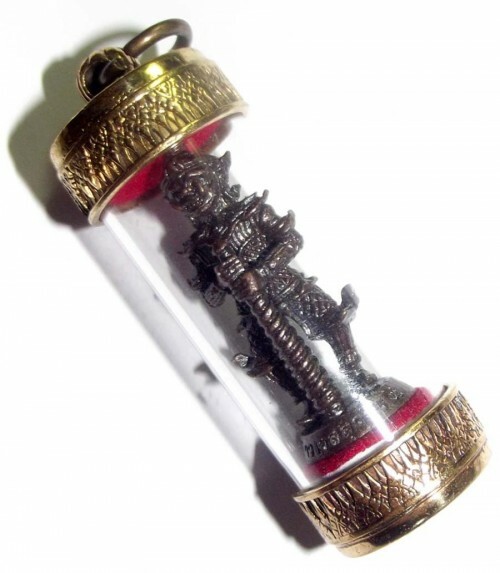 The edition included 2 models of lockets with Pra Sivali statuette, gemstones and 108 or 56 takrut spell inserts. 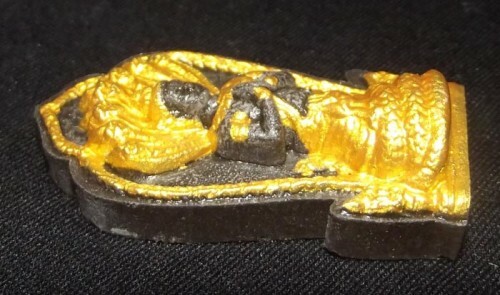 Two different models (jumbo and plod nee) of Pra Pid Ta powder amulets were issued, also with either 108 or 56 takrut and a treasure bee in the back face. Some ritual dagger septres with two faced Taw Waes Suwan asura deva handles (excellent for making holy water for blessings and banishings), and of course these Wua Tanu bucha statues, and small portable loi ongk Wua and Kwai Tanu amulets were also made. 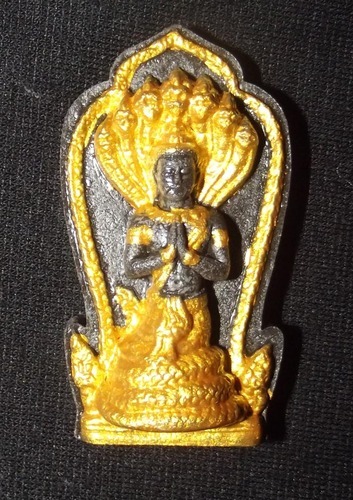 Luang Por Jerd has applied the powerful and authentic wicha of his mentor, Luang Por Noi of Wat Sri Sa Tong, to empower and bless this edition of amulets and bucha statues which we find to be of the hghest quality and has had authentic empowerment. 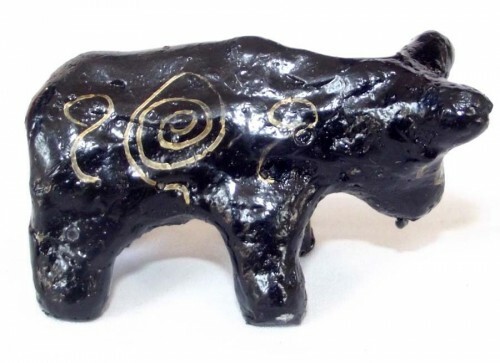 Place the Wua Tanu on a ‘pan kroo’ (prayer tray) or small altar. Offer water to drink (do not let it ever go dry). On holy days and Buddhist festivals offer dry grass or hay. 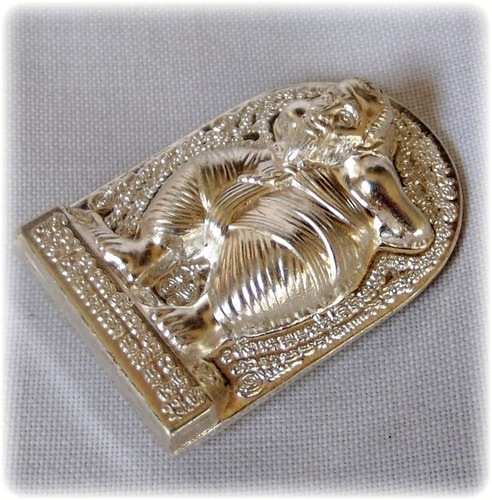 Above is an example of the pan kroo, which can be golden or silver, and is available as an added option when ordering. Use the selection tickboxes to add a pan kroo tray if you wish, and we will send you the bucha statue with its own tray for placement. Wae Taa saa Gu Gu Saa Taa Wae Taa Ya Saa Dta Dta Saa Ya Taa Saa Saa Ti Gu Gu Ti Saa Saa Gu Dta Gu Puu Puu Gu Dta Gu (chant 3 times). 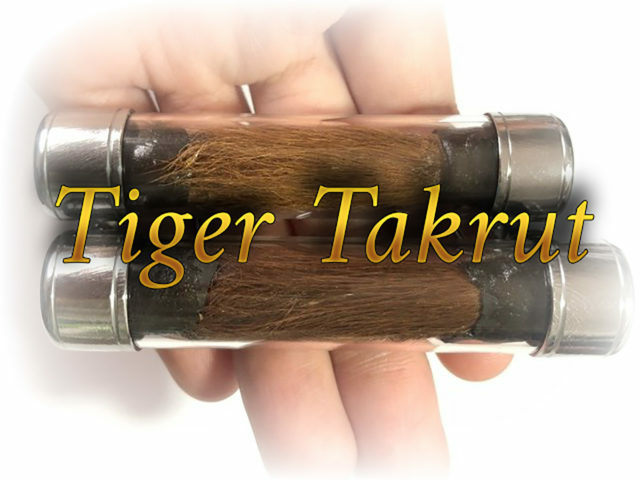 Material: Cast sacred metals filled with sacred powders and takrut, colored ribbons. 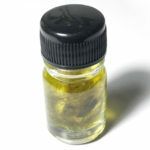 Recommended Uses: Protect and banish black magic, thieves, demons, enemies and backstabbers. Gambling, attract wealth and treasures. Eliminate Enemies. 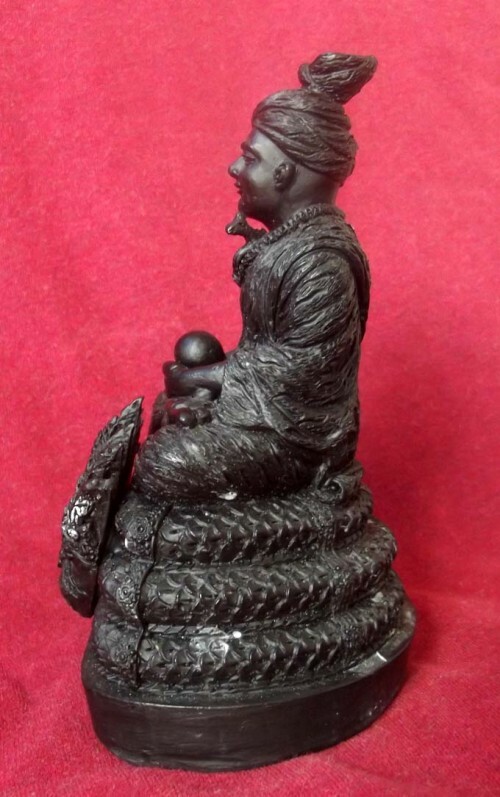 Phu Sri Sutto Nakarach – Naga King Deity of Bodhala (Naga Underworld) – Bucha size statue in Sacred Resin with Sacred powders in base, and turtle amulet insert. The statue is very heavy for 3 x 5 Inches at almost 1 Kilo. Always Chant the Maha Namasakara (Namo Tassa) 3 times before Chanting to Buddhist Amulets. Ayang Mahaa Naako Itti mandti Tudtimandto Imichaegaalaena Mahaa Naakang Bpuuchaemi (Chant 3 Times). There are Six Great Kings of Nagas along the banks of the Mekhong between Laos and Thailand, which he calls the Nakatibodee. The Laoatian Side dwells Paya Sri Sadta nakarach, and the Thai side is inhabited by Paya Sri Sutto Nakarach. Paya Sri Sutto liles to keep the Sila (Moral Virtues) and Practice the Dhamma. He has a Gentle and Compassionate Manner. He does not like to Challenge or Disputes, and likes to practice Dhamma in Nakorn Panom. When he is practicing his Austerities he then hands the Administration of the Area over to the Six ‘Amamaj’ (Captains) of the Nagas, to watch over his Kingdom whilst he Practices. 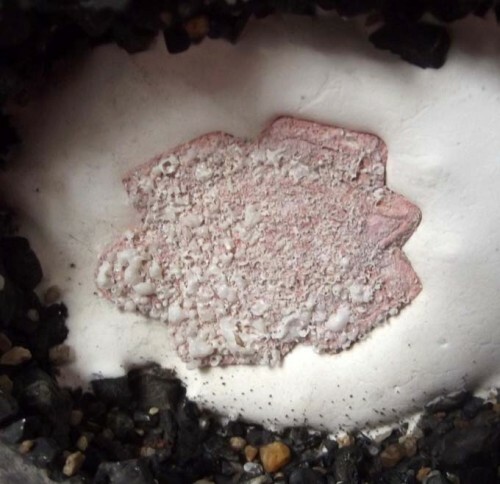 A Sacred Powder Turtle Amulet is inserted into the sacred Powders of the Base opf the statue which is lined with sacred minerals (rae). 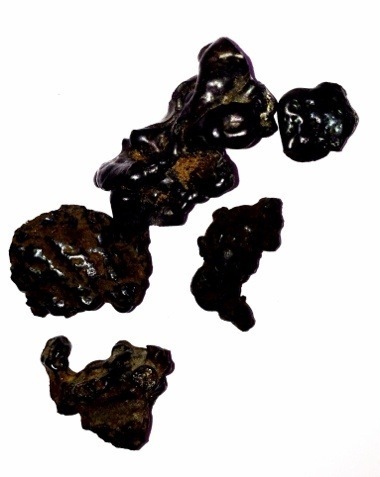 Sacred Muan Narn of Naga related substances are sprinkled over the Turtle amulet. 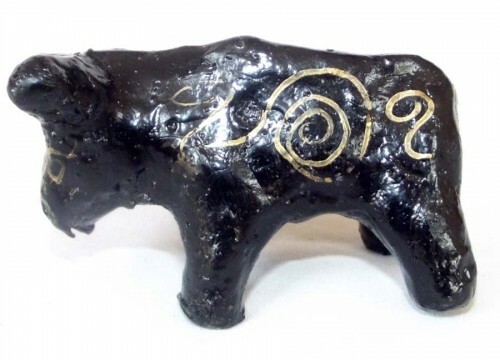 Made From Sacred Black Powders withpaiinted gold embellishments. Empowered with Kong Grapan, Klaew Klaad and Maha Lap Magic, and Invoked with the Deva Phu Sri Sutto Nakarach, the Naga King and Ruler of Bhodala (Mueang Badan), the Underworld Kingdom of the Nagas. It is not possible for the Nagas to Remain for Very Long in the Dimensional Sphere of the Human Realm. The God Indra bestowed the Nagas with Three Entry Points to the Human Realm. One in Vientiane (Laos, One in Nong Kante, and the third in the ‘Prohm Pragay Loke’ (Kam Chanote in the Mekhong Region). 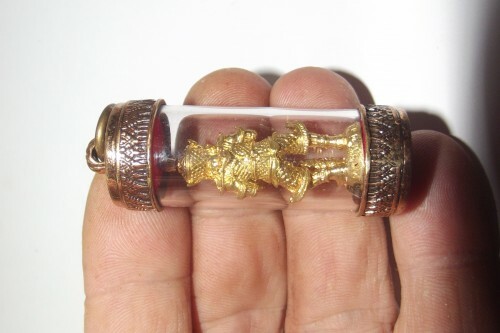 The image can be worn as an amulet, kept on the Altar (below Buddha images, not above) for Bucha, or even be used to Make Holy Water to use for blessings and protections (spray on objects and persons). 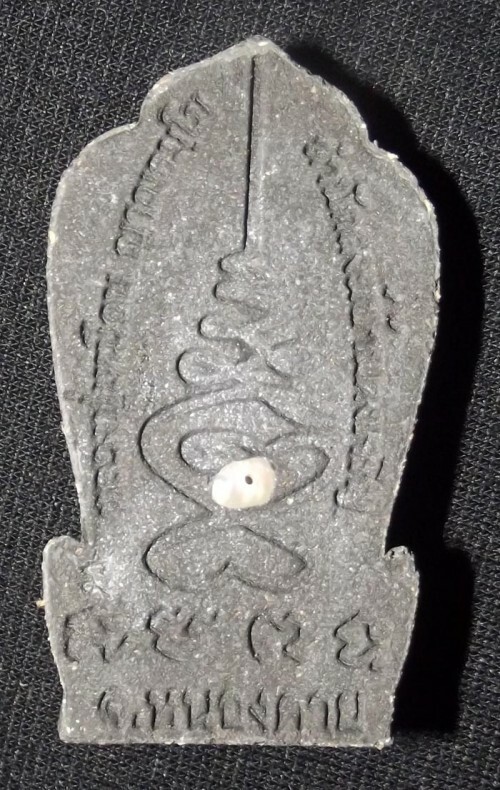 The rear face of the amulet has a real sea pearl inserted into the Black sacred powders, which have a large amount of Lek Lai Powder Grains mixed into it, with powerful Kong Grapan, Klaew Klaad and Maha Lap properties to Protect from Dangers and attract Wealth, Power and Success. The Great Luang Phu Kampant Kosa Panyo of Wat Tat Maha Chay, Nakorn Panom, said that there are Six Great Kings of Nagas along the banks of the Mekhong between Laos and Thailand, which he calls the Nakatibodee. The Laoatian Side dwells Paya Sri Sadta nakarach, and the Thai side is inhabited by Paya Sri Sutto Nakarach. 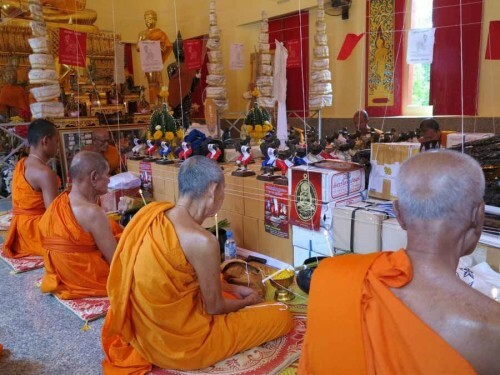 Paya Sri Sutto likes to keep the Sila (Moral Virtues) and Practice the Dhamma. He has a Gentle and Compassionate Manner. He does not like to Challenge or Disputes, and likes to practice Dhamma in Nakorn Panom. When he is practicing his Austerities he then hands the Administration of the Area over to the Six ‘Amamaj’ (Captains) of the Nagas, to watch over his Kingdom whilst he Practices. 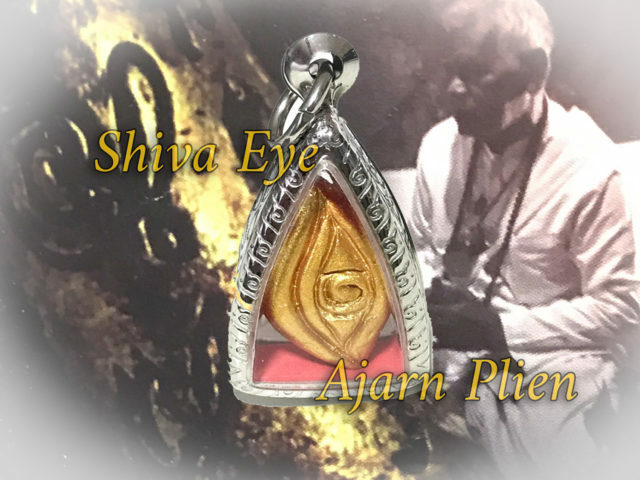 The Metta Baramee of the Naga King brings a very similar effect as the Pra Sivali amulet, bringing Riches and attracting Metta from others. Popularity, Success, Promotion, Wealth and treasures. 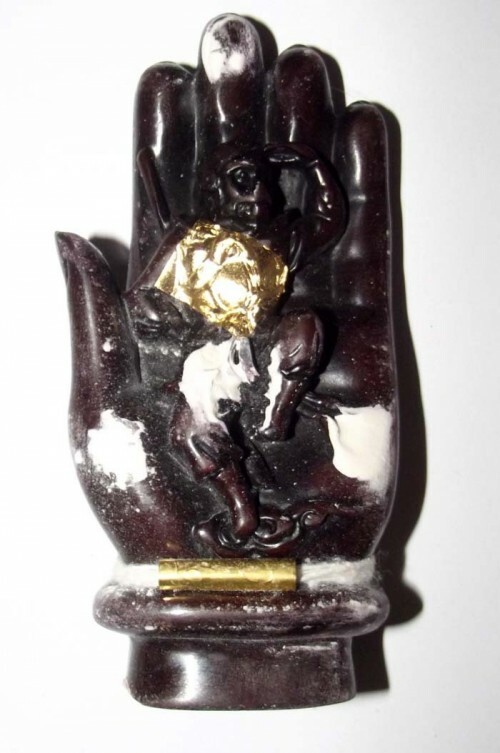 In addition, Protection against Black Magic and Evasion of Deadly Dangers is also bestowed upon His Devotees. The Temple of Luang Phu Hmuean is situated in Nong Kai and is extremely close to the Abode of Phu Sti Sutto, Luang Phu has called upon Phu Sru Sutto to empower the amulets with the power of his presence and bestows blessings of protection and prosperity to the Devotee. Ayang Mahaa Naako Itti mandti Tudtimandto Imichaegaalaena Mahaa Naakang Bpuuchaemi(Chant 3 Times). 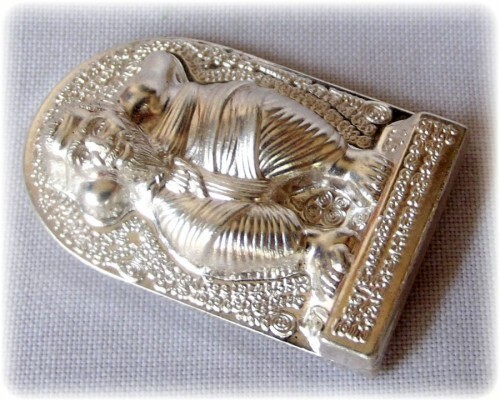 Comes in Original Box from the Temple – can be encased if desired.